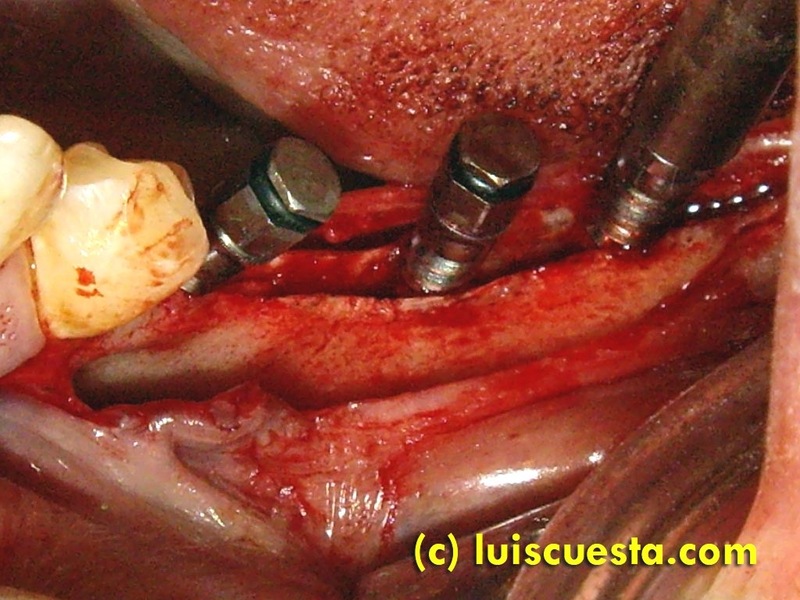 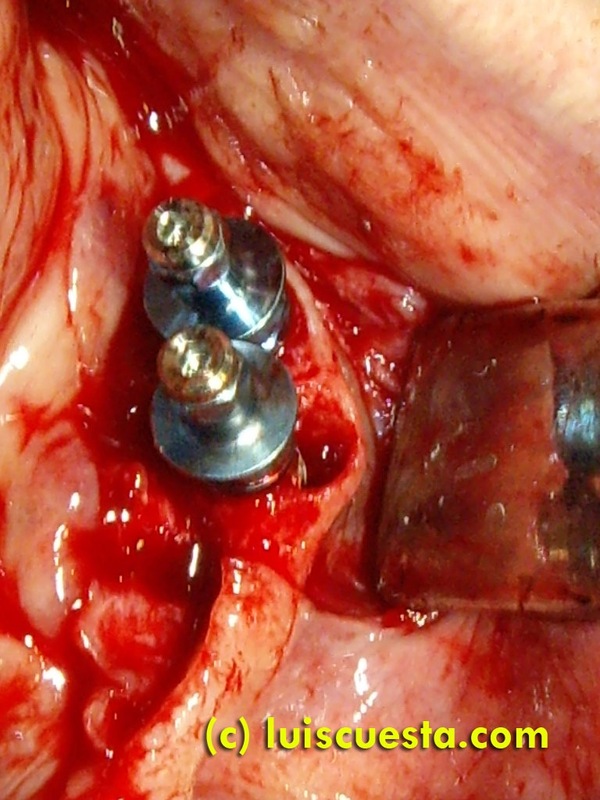 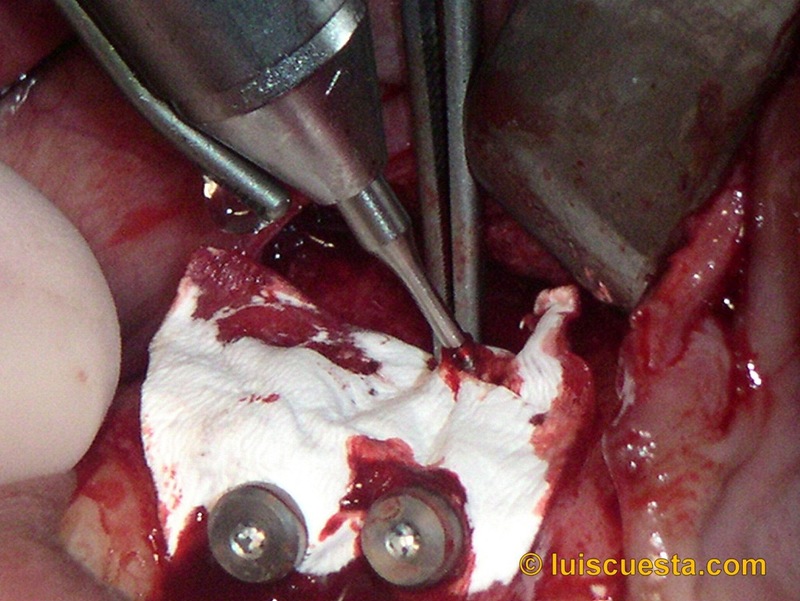 This is a complex case of first-stage bone regeneration in order to set two implants in the next phase. 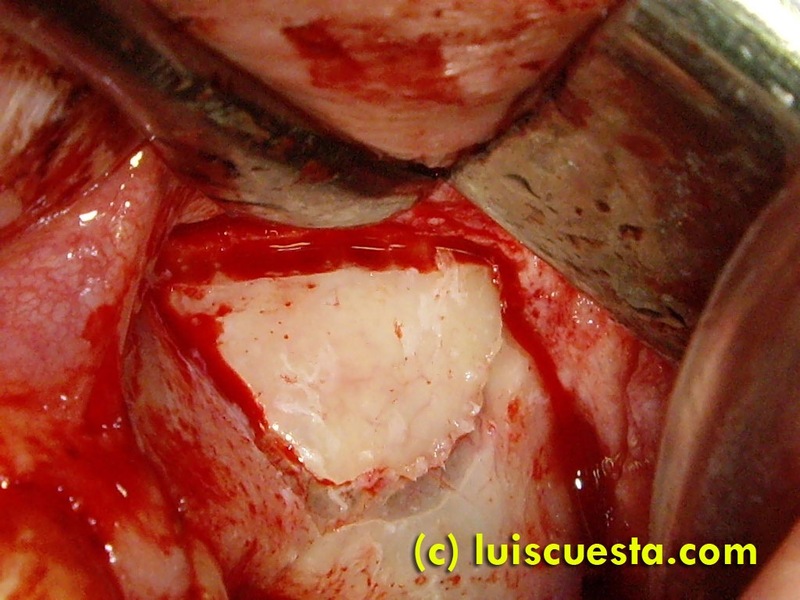 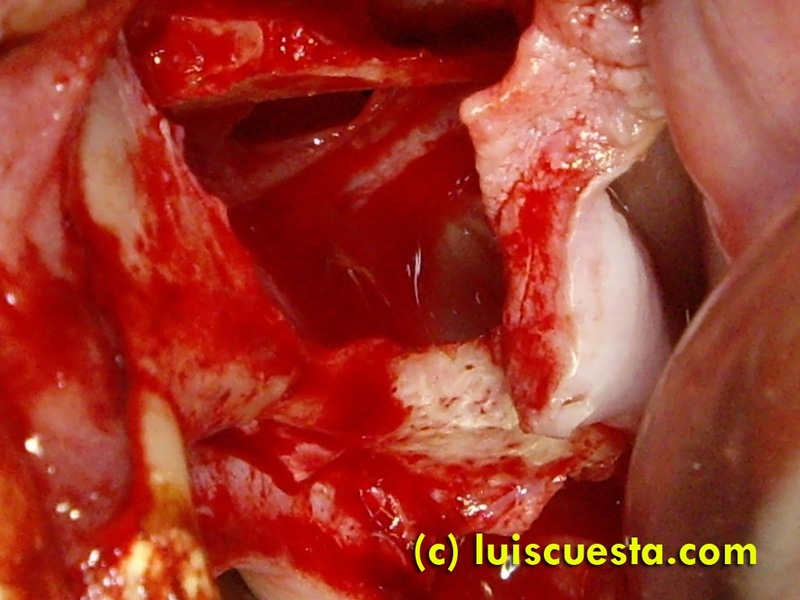 There is also an impacted 13 cuspid, at 45º angle, on the vestibular side, that needs to be extracted. 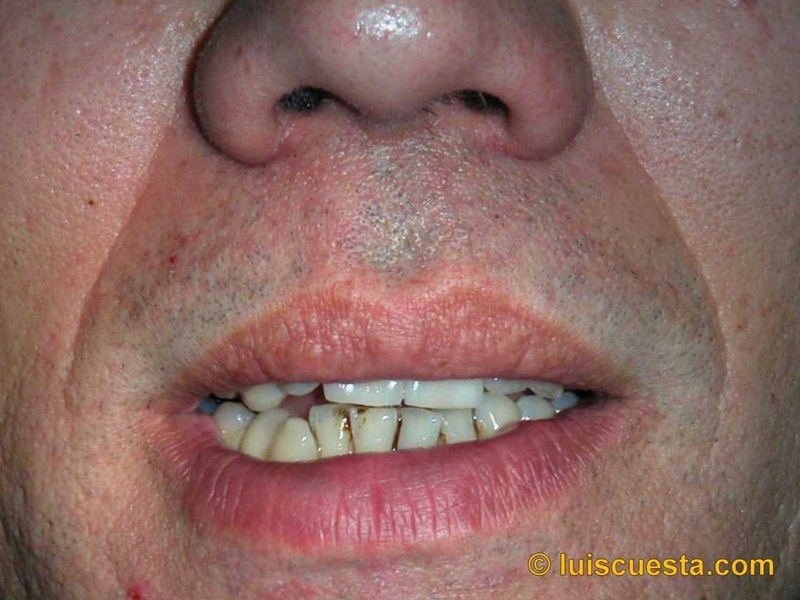 More than ten years edentulism in this 28year old patient have left an atrophic ridge “V”shaped, with not enough height as to fix implants simultaneously to the sinus lift. 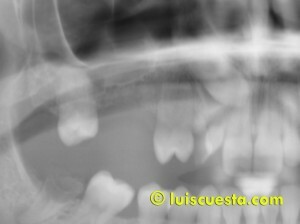 I open a large flap and drill a lateral window on the bone, setting its lower limit at the estimated height from the ridge I calculate from the X-ray. I push the window into the sinus and press the sinus membrane up. 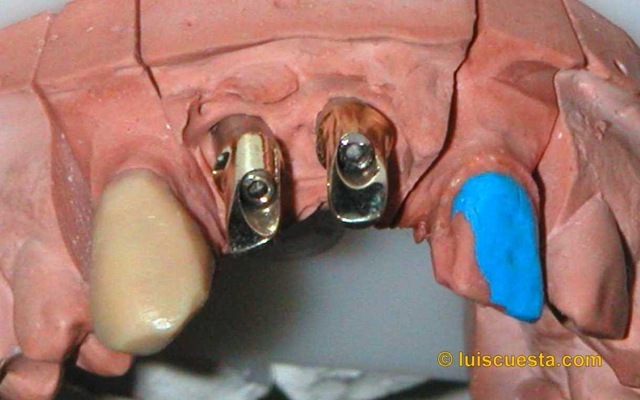 I measure the crestal bone with from the inside with a probe or curettes to confirm weather the implants can be fixed at this stage or not, depending on factors (bone height, width, density). 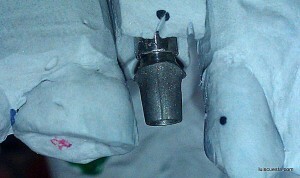 I estimate that the with and height are not sufficient for now, and with will be narrow for the future, also. 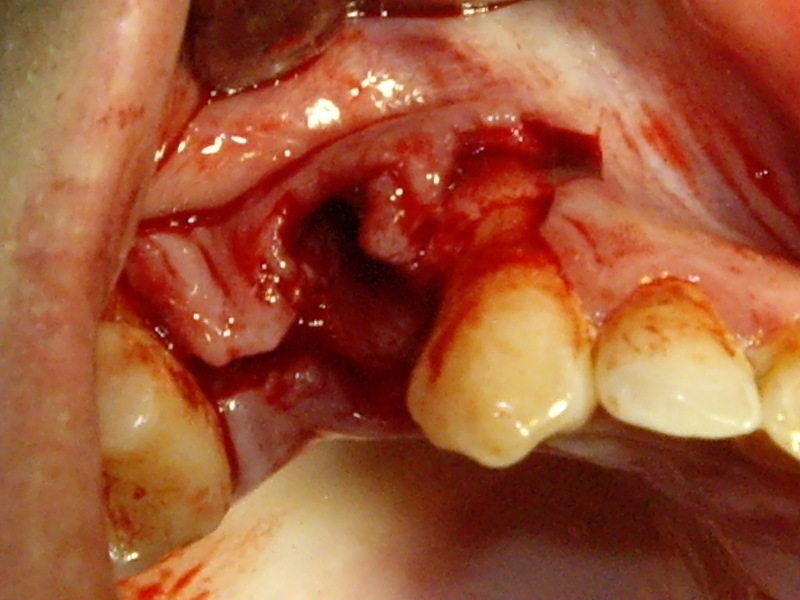 So I split the crestal bone with a disk saw and chisels . 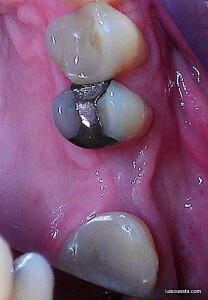 I fill the sinus and the ridge crack I opened with 1gr. Bio-Oss and cover the whole graft with a resorbable Bio-Guide collagen membrane. 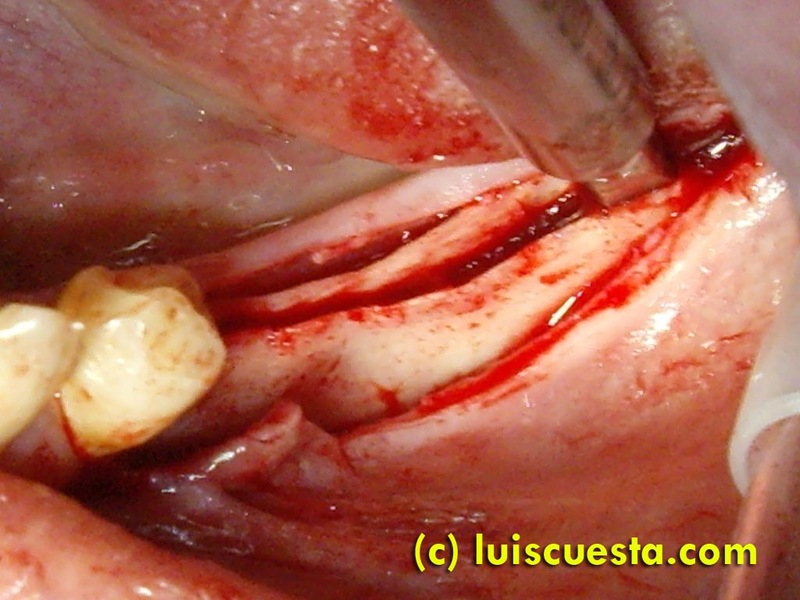 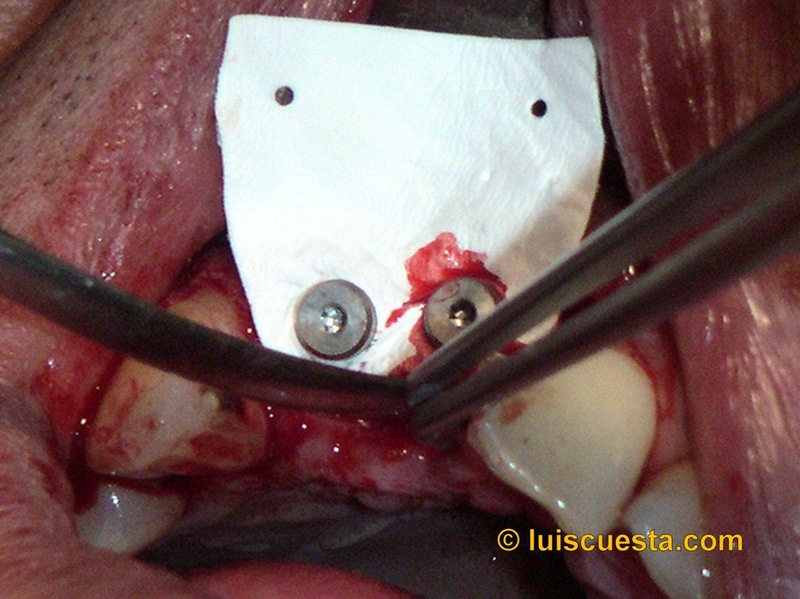 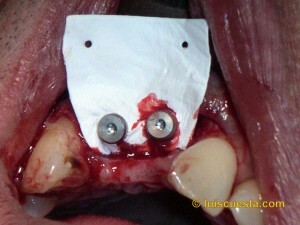 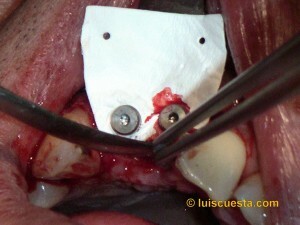 Stitching this flap section back in place, as I will continue with the cuspid extraction. 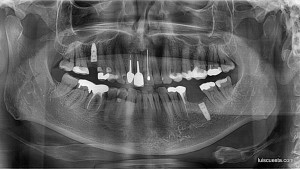 6 months will be needed to approach the next phase, which is the placement of the implants. 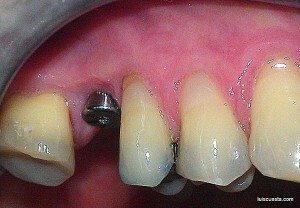 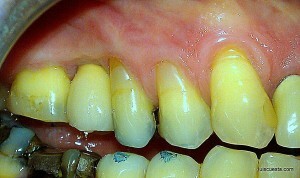 Further ridge augmentation may be needed, depending on the bone stabilization. 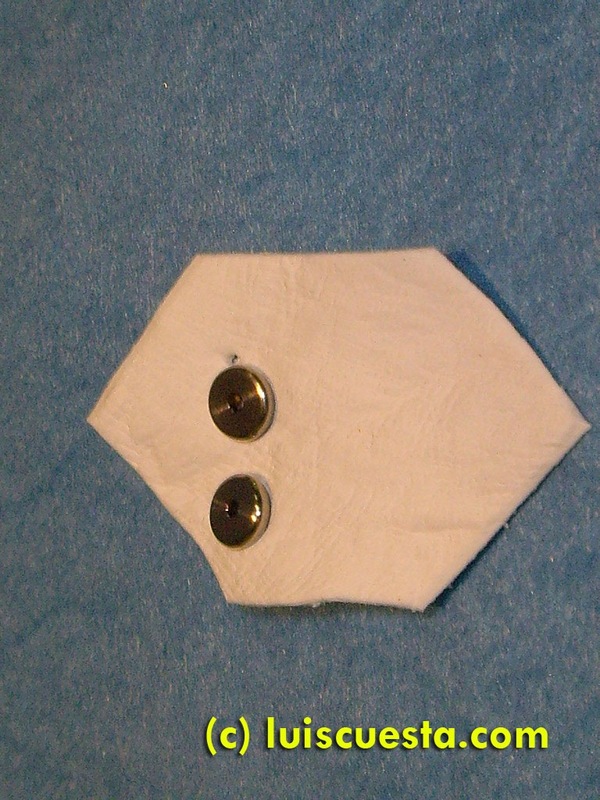 The cuspid lays at a 45º angle, on the vestibular side, as I have made sure by touch. With a round bur I open a window on the bone at the estimated position I calculate from the X-ray and finger relief touch. 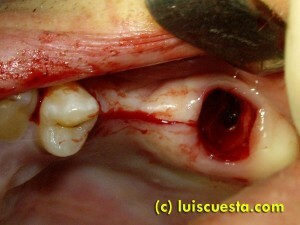 I soon feel the different hardness of the enamel compared to the bone. 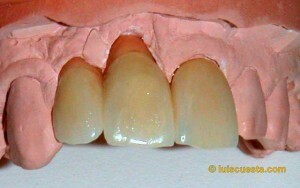 I widen the window until I see there could be enough space for the crown to come out. 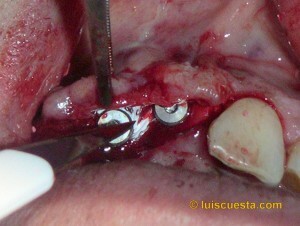 I cut the crown using the same bur and pull it out with pliers and leverage forces. If the root is not hardly anchored, It can be pulled out by using a large endodontic round section file, #60 in this case. The patient will have a bridge done in this section. 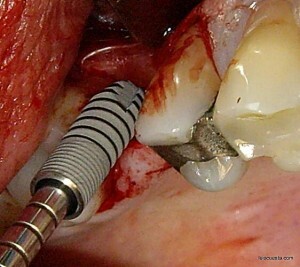 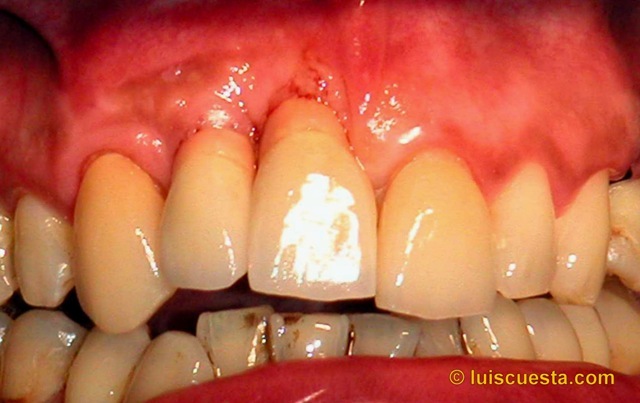 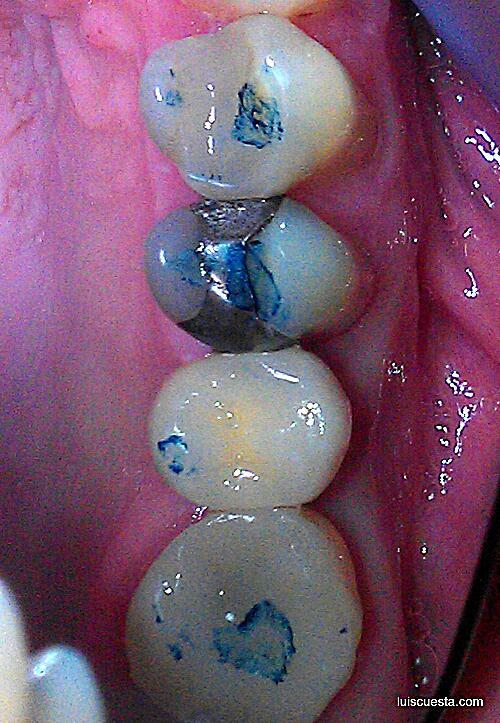 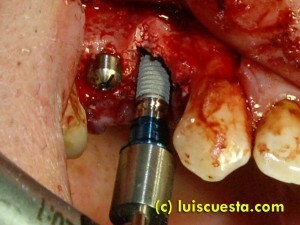 So there is no need for bone graft to prevent resorption. 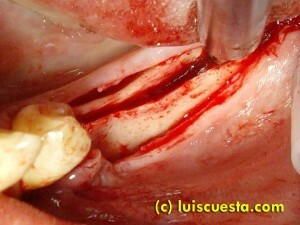 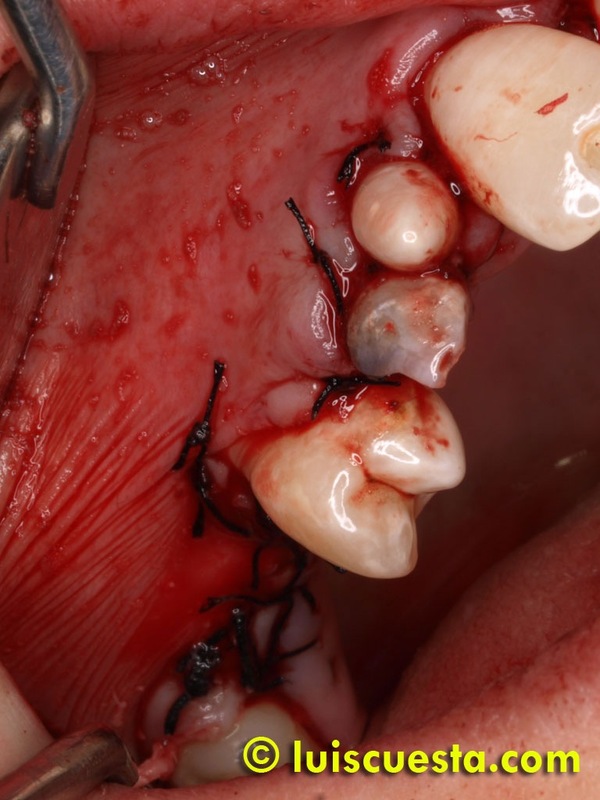 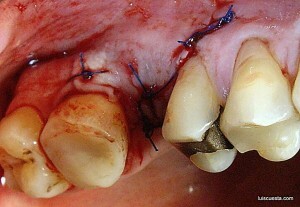 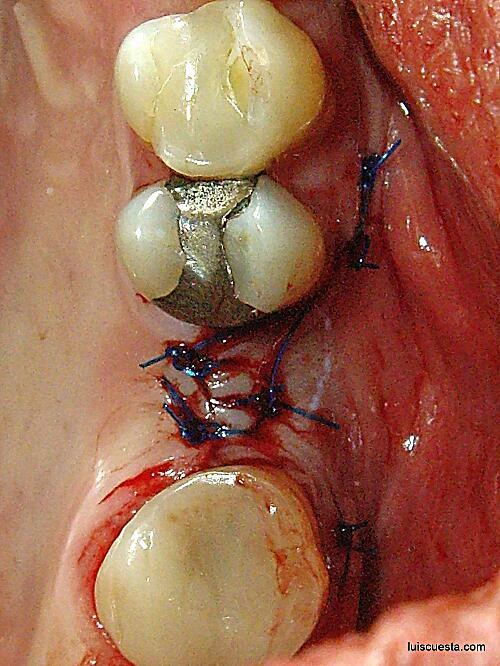 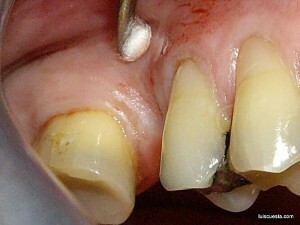 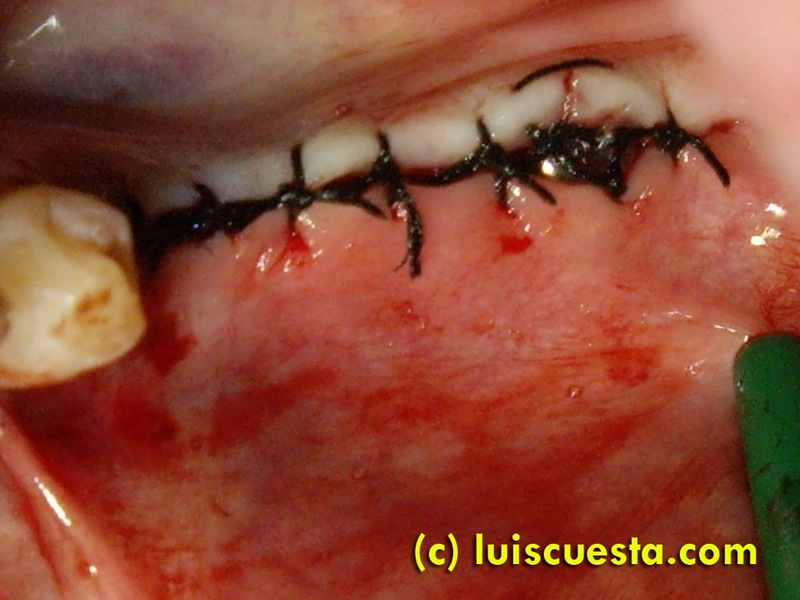 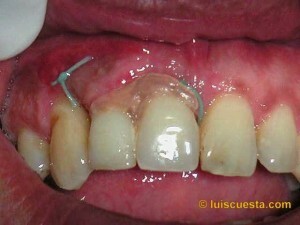 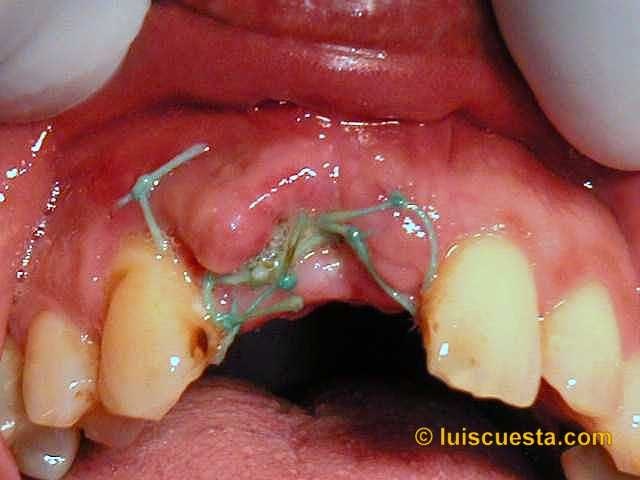 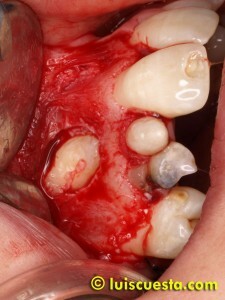 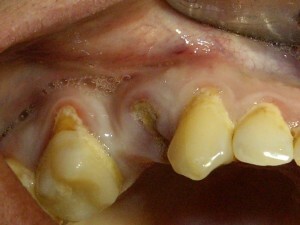 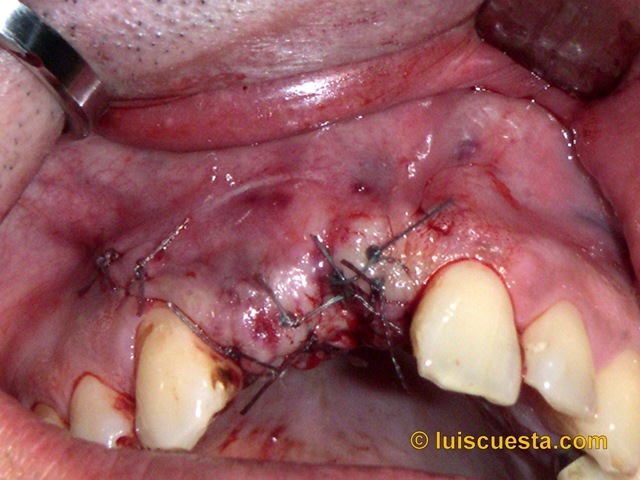 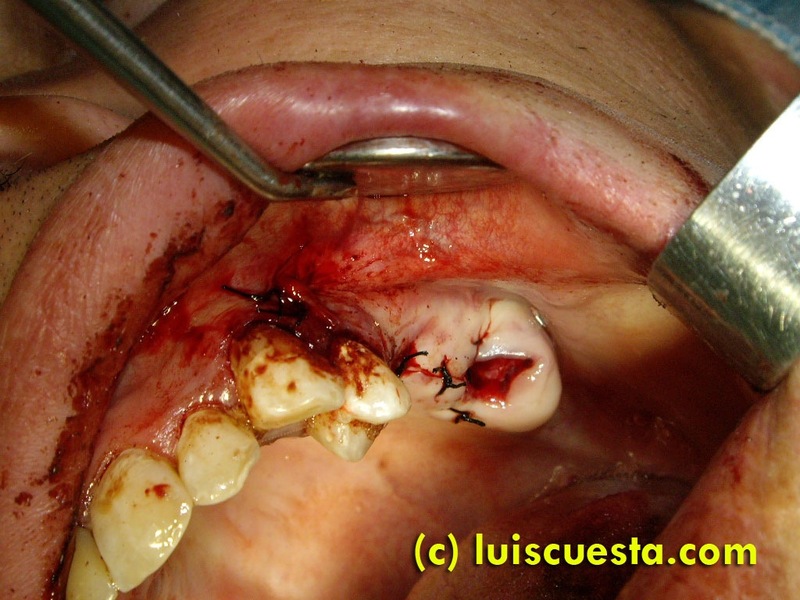 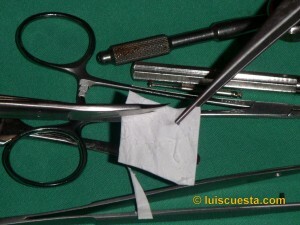 Stitches are used to close the flap in place over the gum. 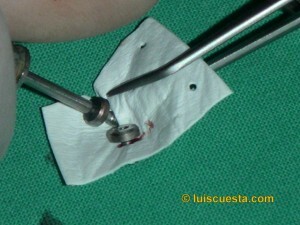 First day of surgery. I place implants on the left jaw. 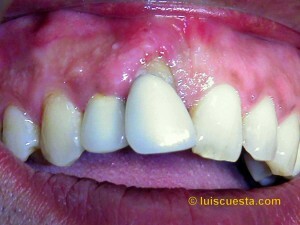 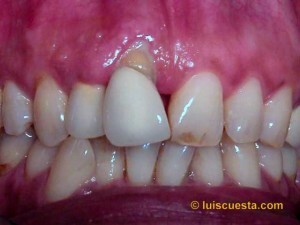 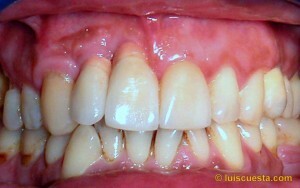 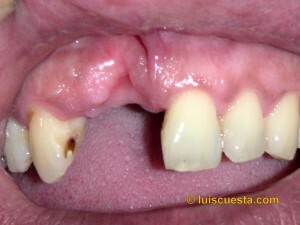 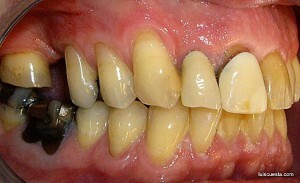 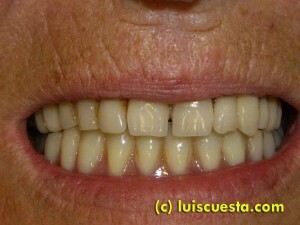 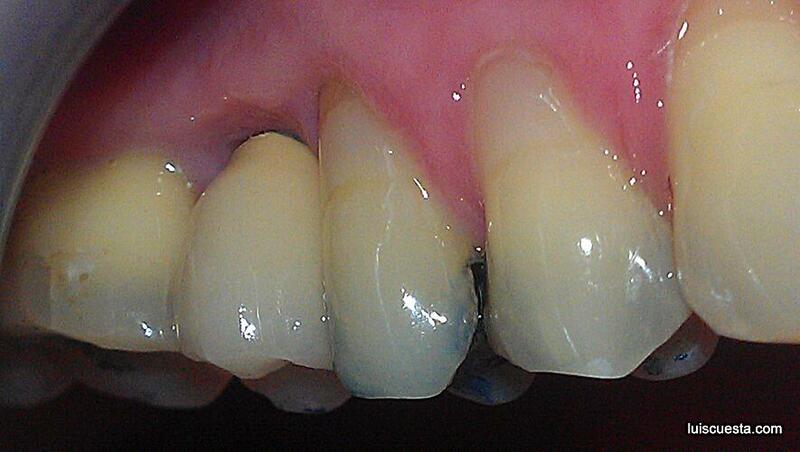 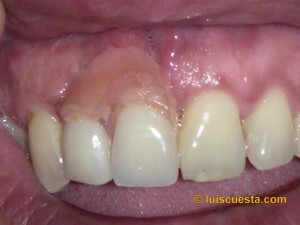 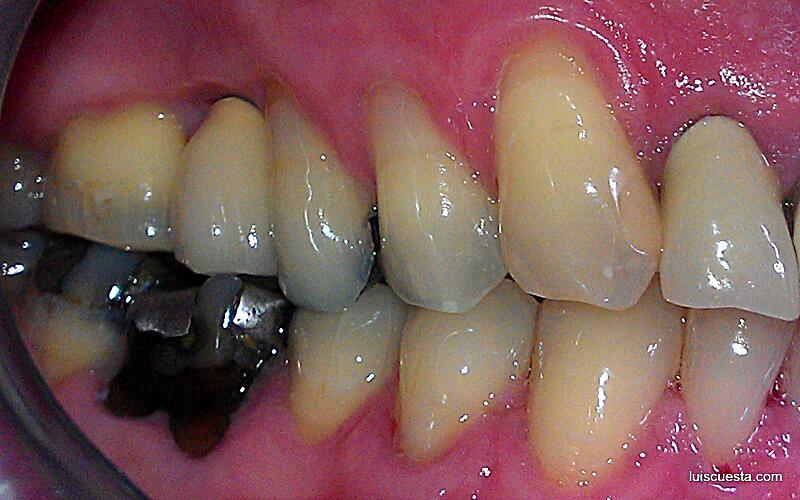 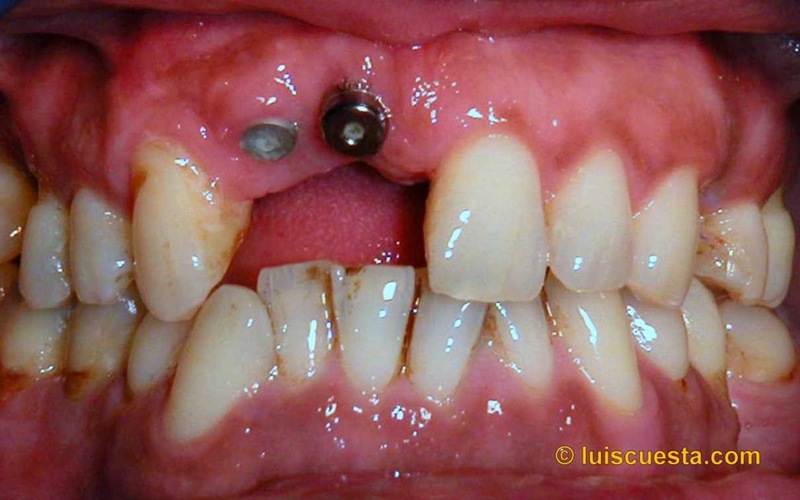 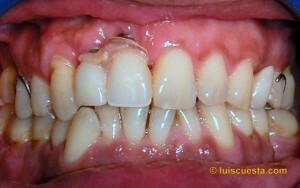 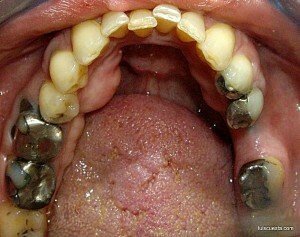 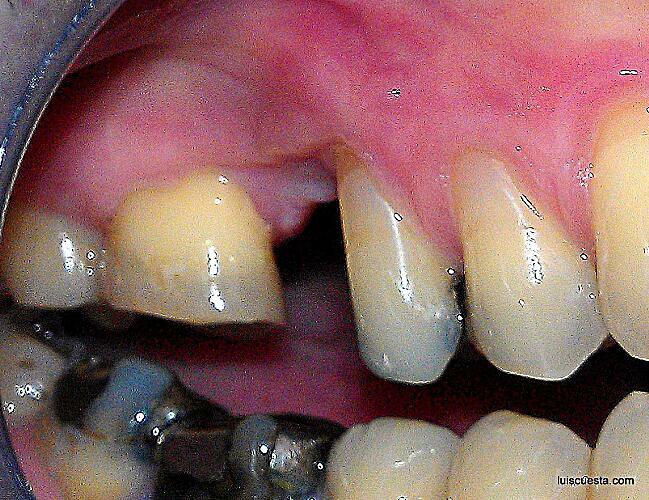 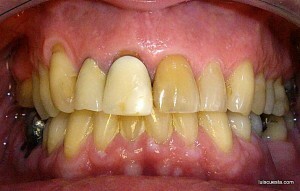 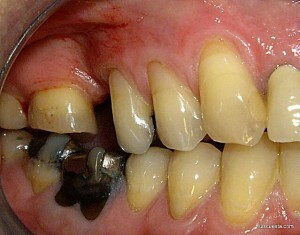 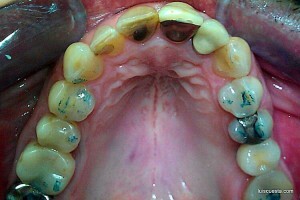 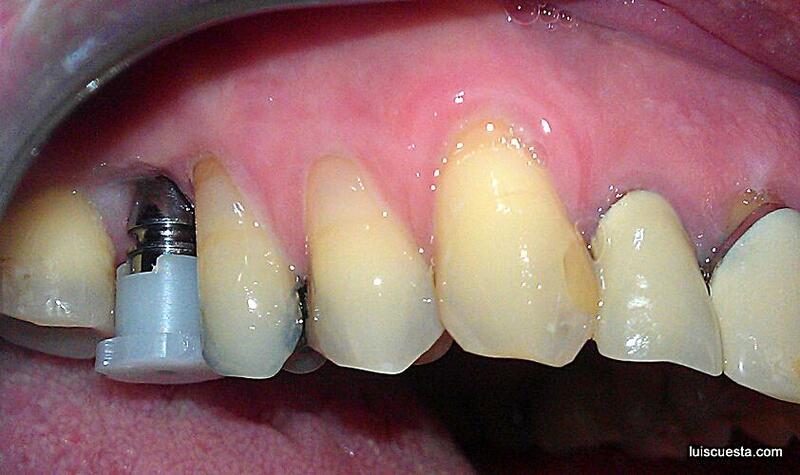 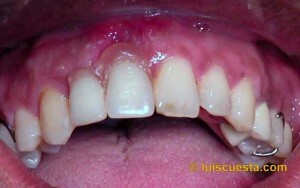 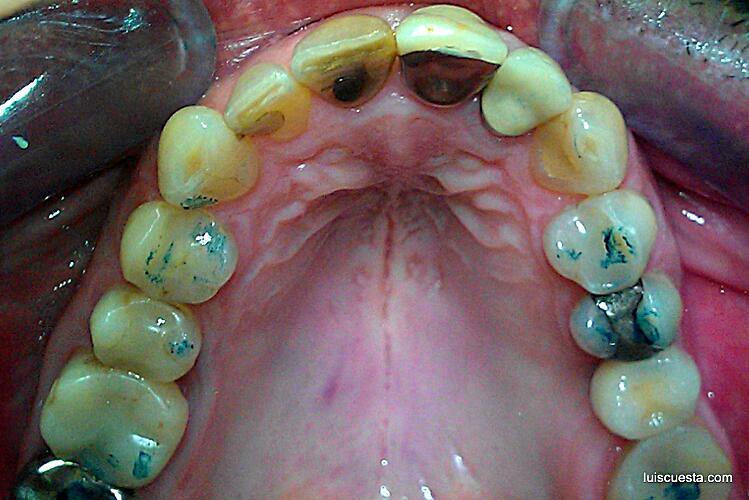 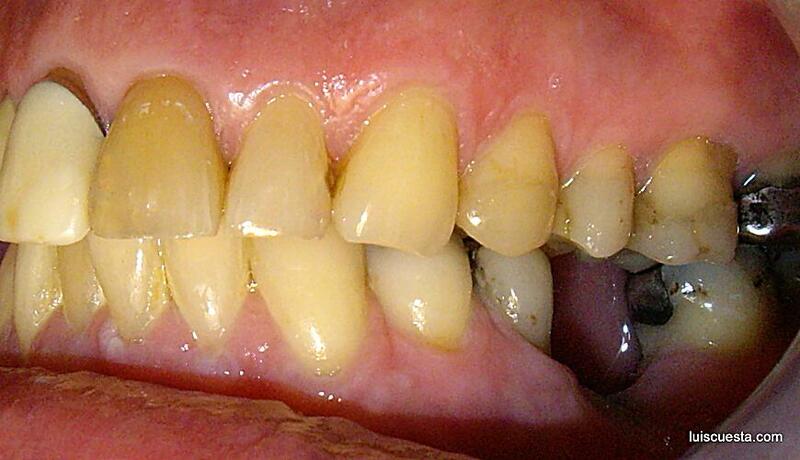 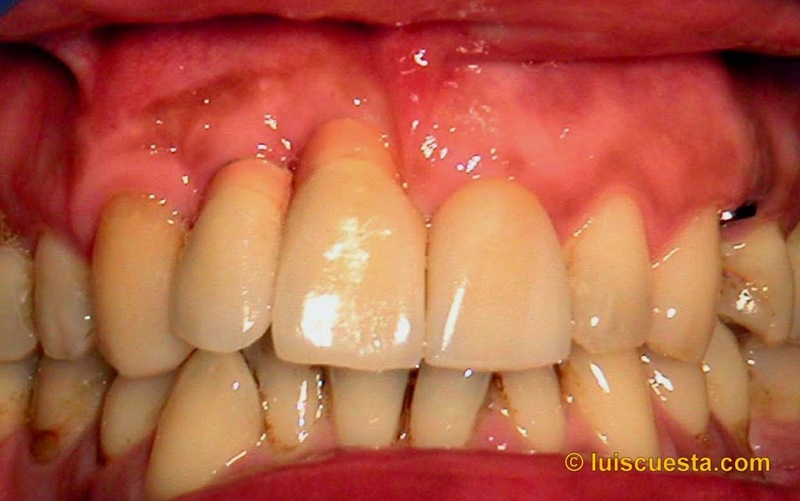 Many years without teeth have left a collapsed, atrophic ridge, both in width and height. 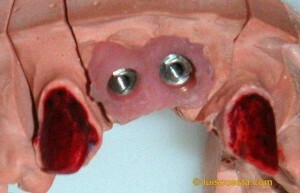 The inverse “V” shaped ridge is not wide enough as to place the narrowest 3.25” implants. 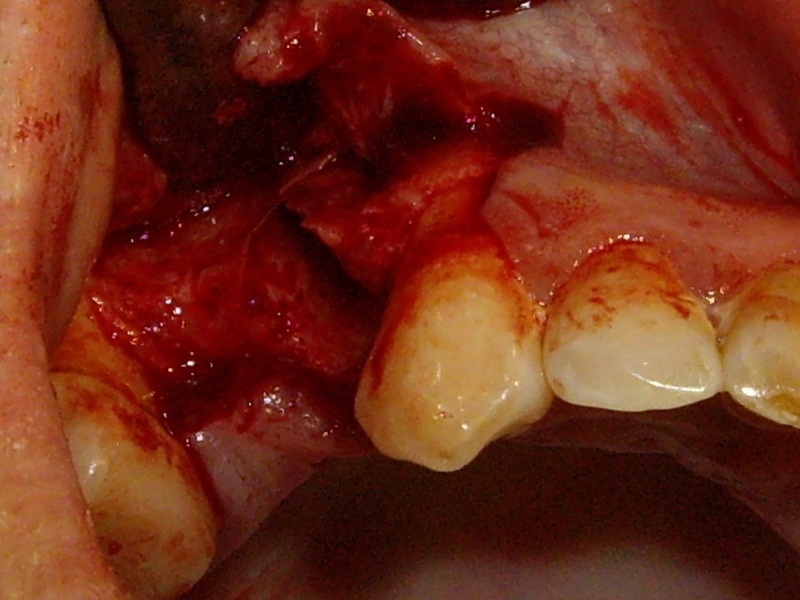 So, I use a radial saw to slit the bone, working the expansion to the spongeus with chisels. 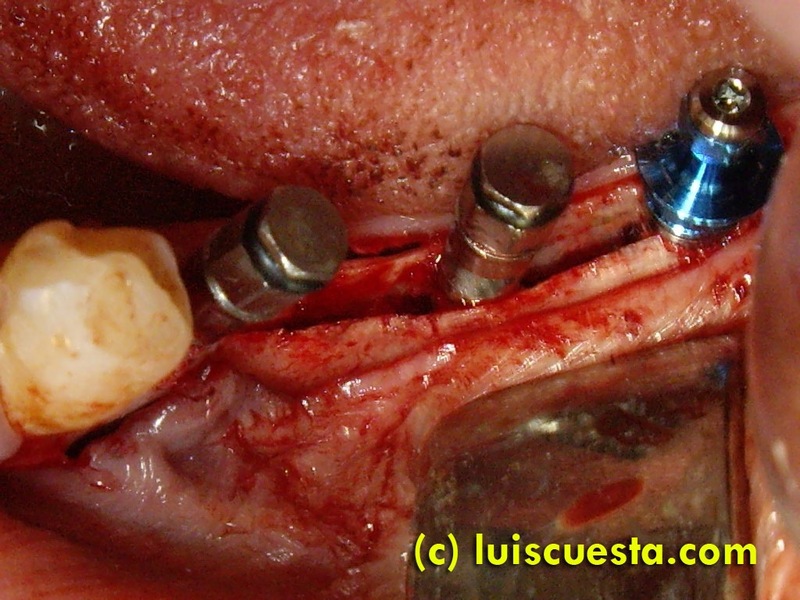 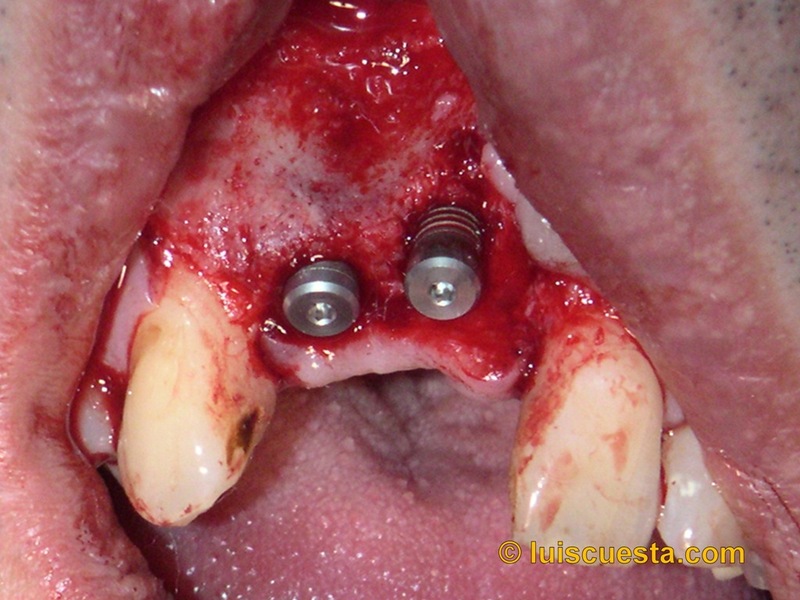 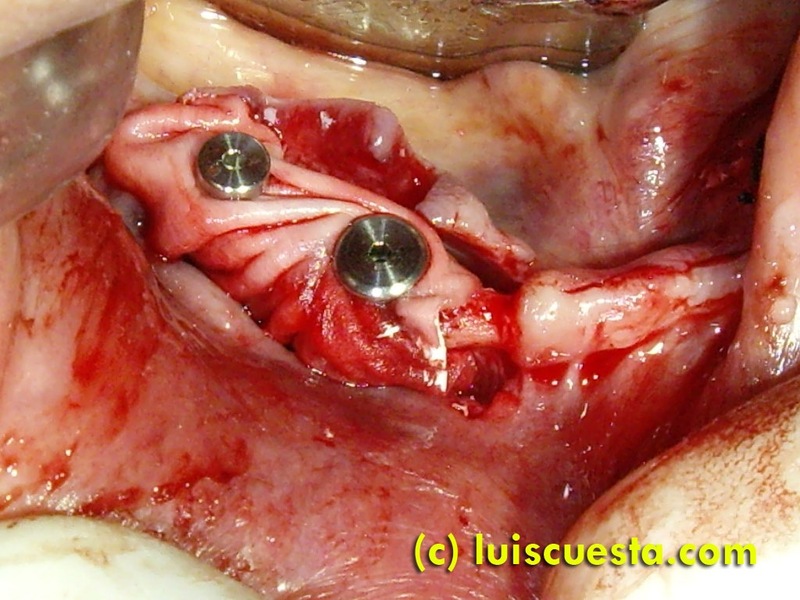 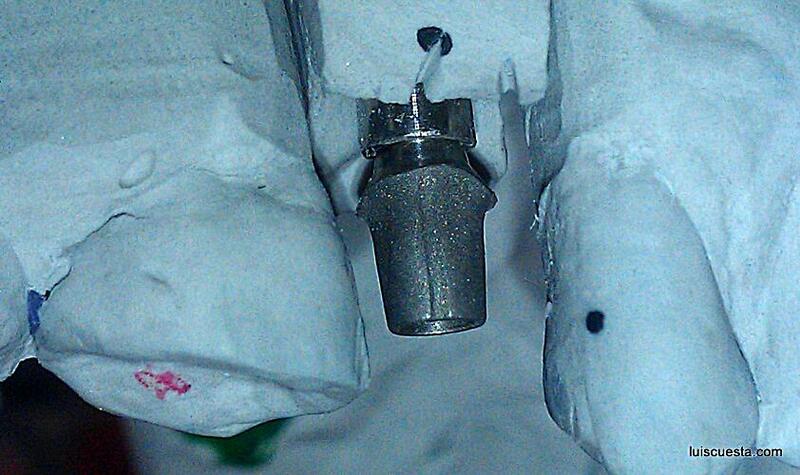 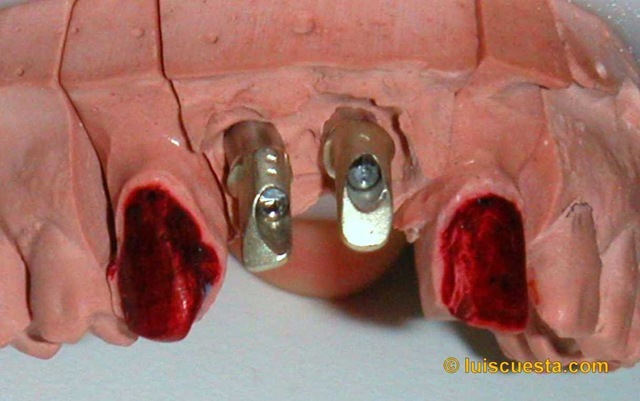 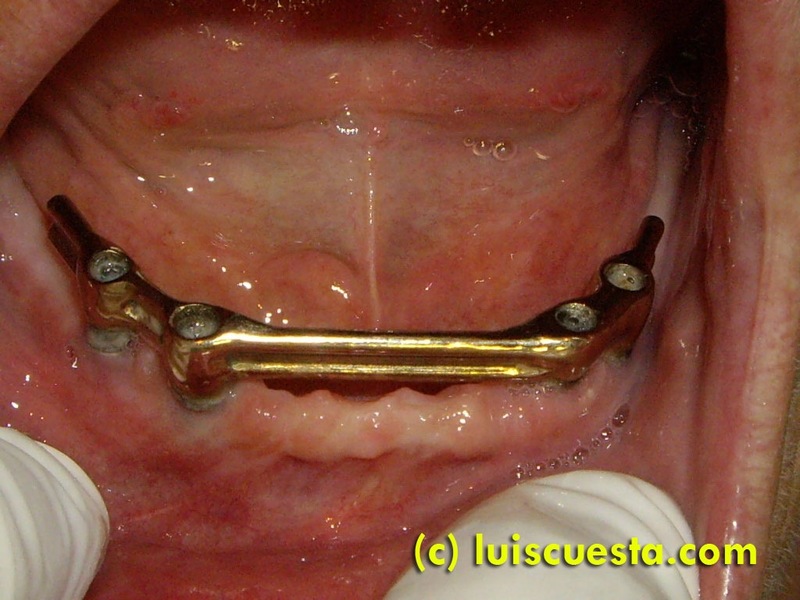 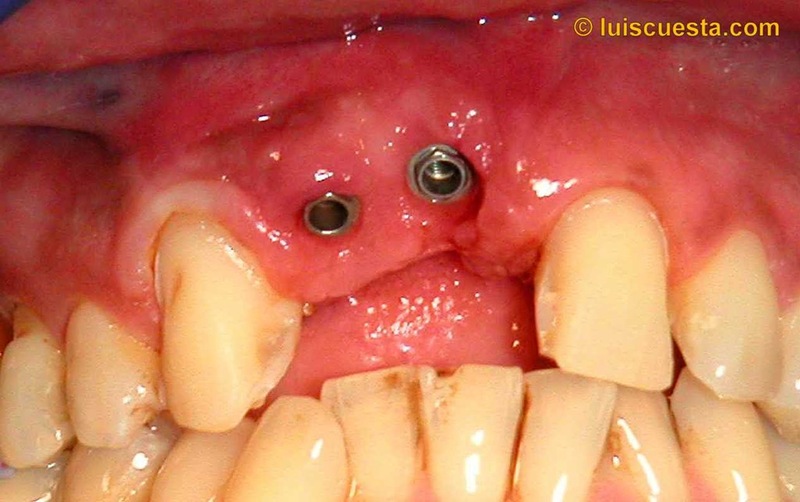 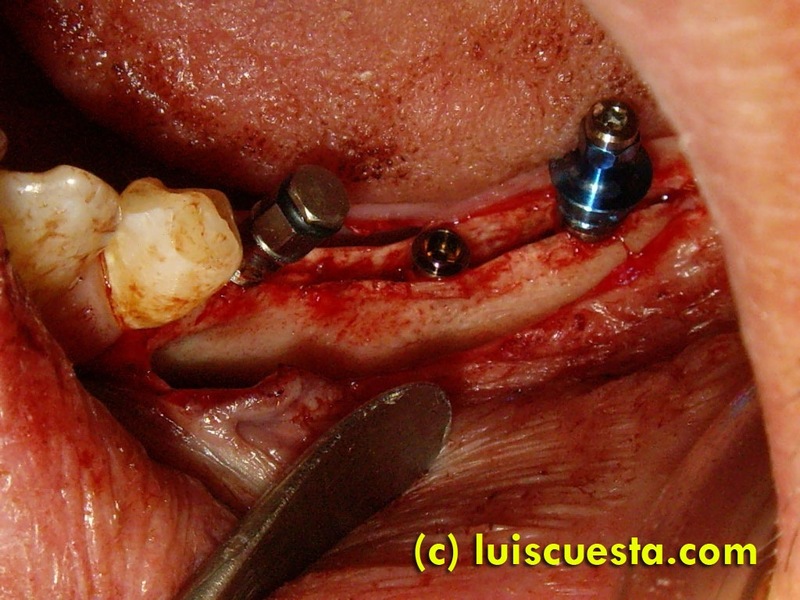 I place a short 11.5×3.75” at the back , a 13×3.25” and a 15×3.25” angled towards liguo-mesial in order to avoid the mentonian hole and allow for bigger implant length. 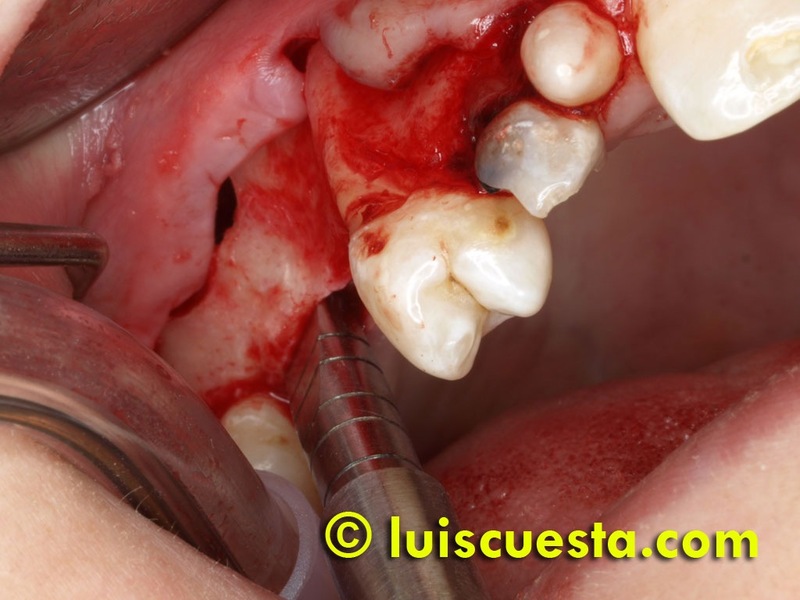 Then, it’s time to fill the gap between corticals and implants with Bio-Oss bone graft and cover it with a Bio-guide resorbable collagen membrane fixed by the healing screws. 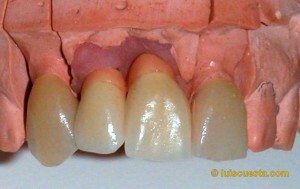 On the right side there is even a shorter ridge. That means the leverage forces will be greater. 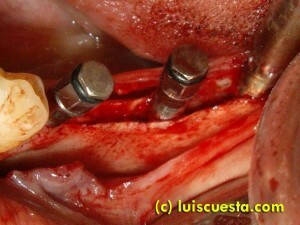 I repeat the bone split process an drill carefully with an angle towards lingual, allowing the mentonian nerve to pass by vestibularly. 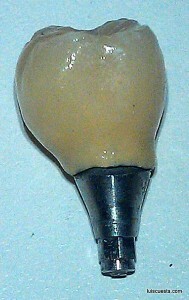 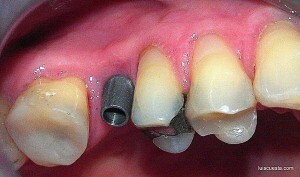 A 3.75×13” implant at the back, and two 3.25×15” in the front. 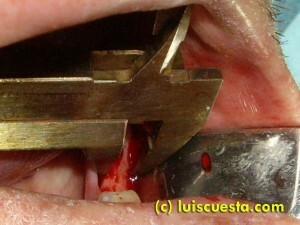 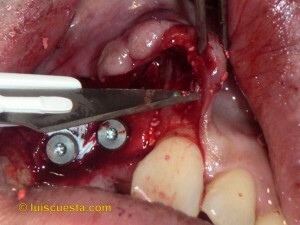 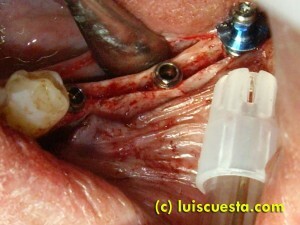 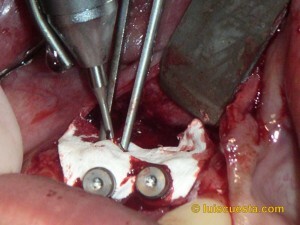 The second surgery is on the upper right jaw. 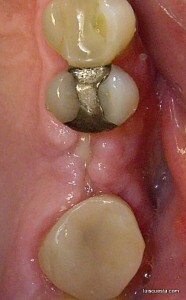 There is a “one-and-a-half- tooth” space. Too narrow for two regular teeth. Too wide for just one. 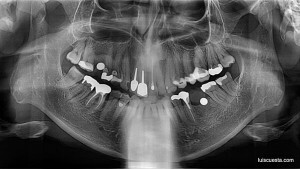 Besides, there is a low sinus. 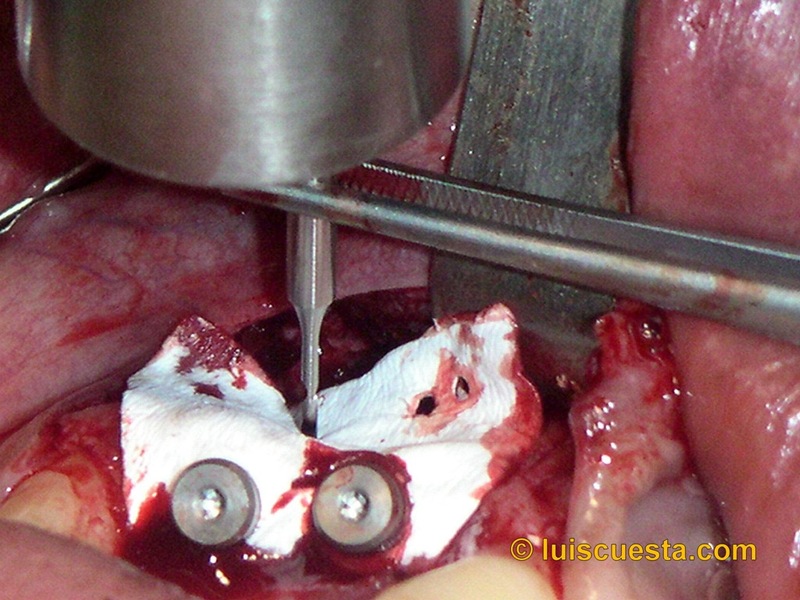 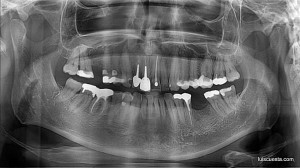 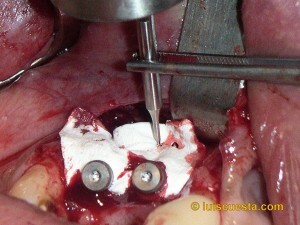 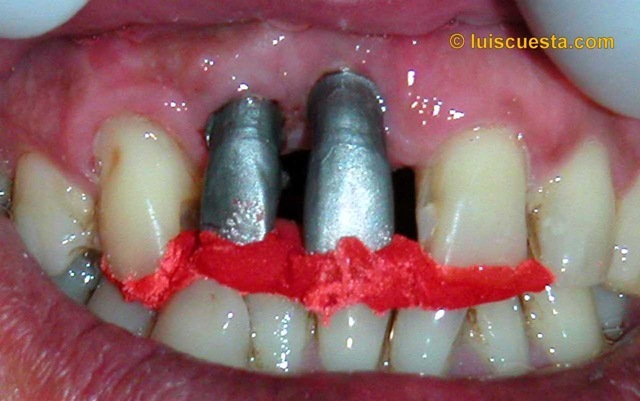 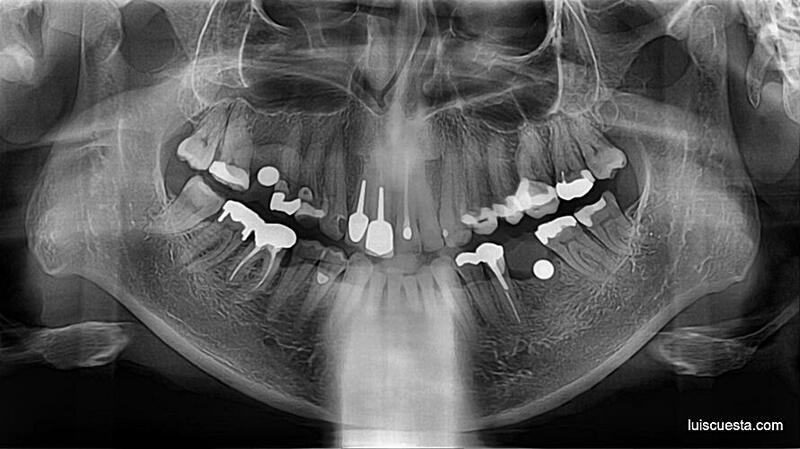 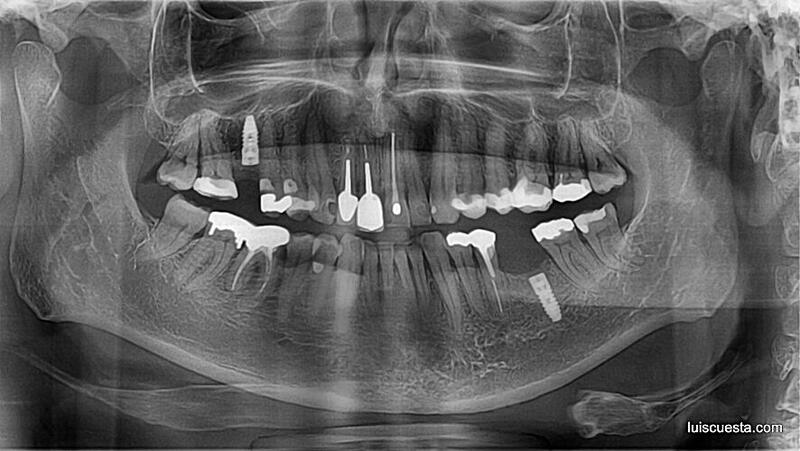 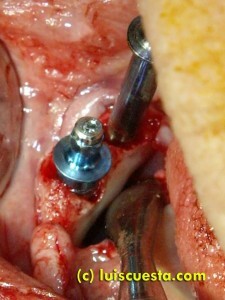 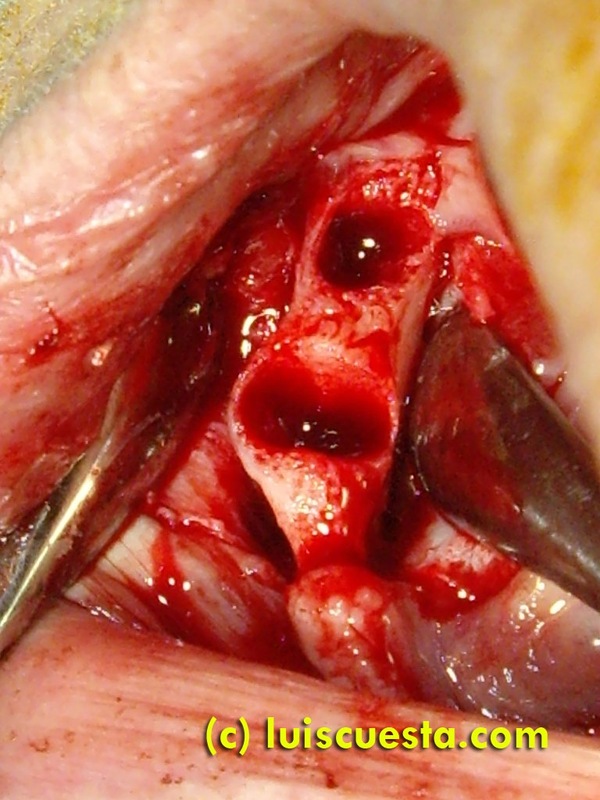 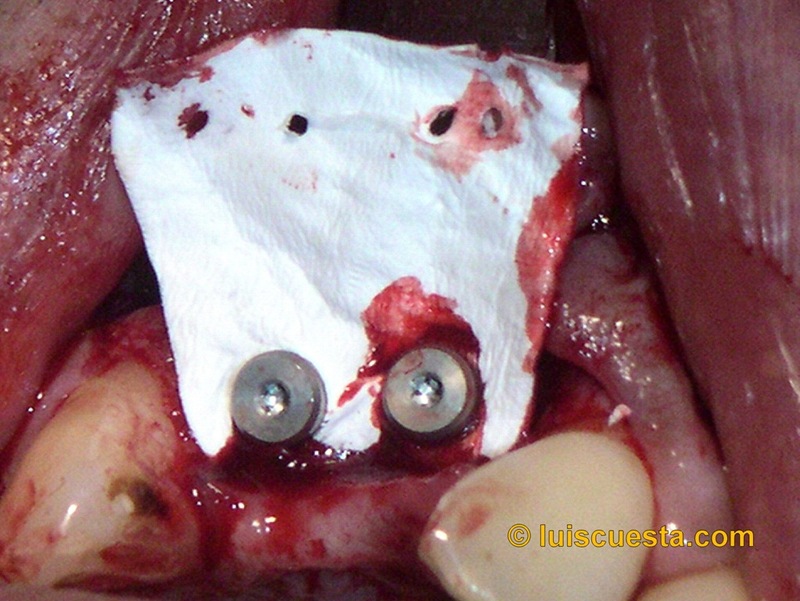 The little bone support, even with sinus lift bone graft (less dense), could be a challenge for long term expectancy. 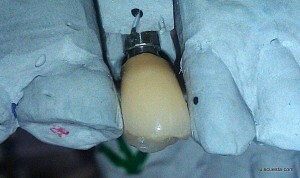 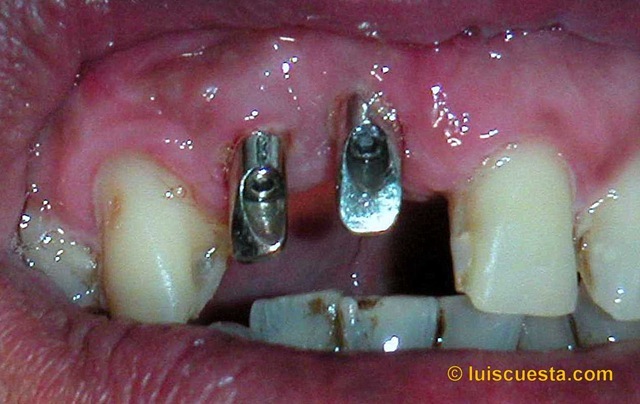 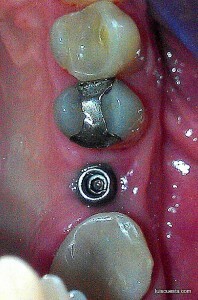 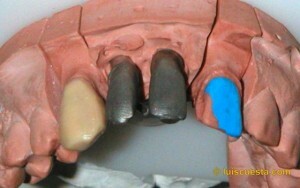 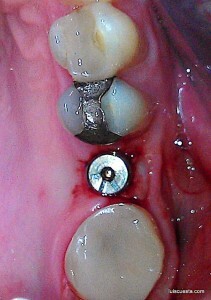 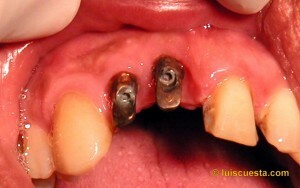 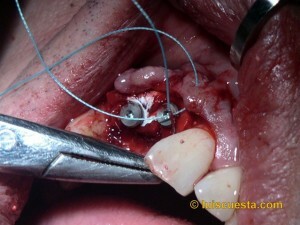 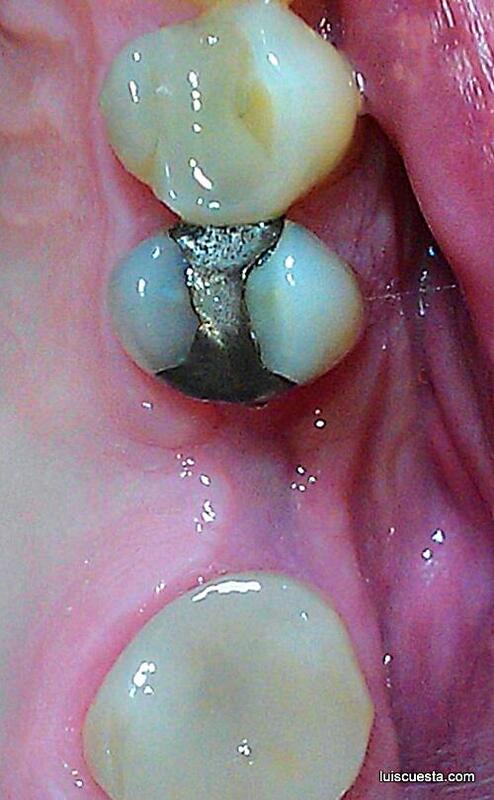 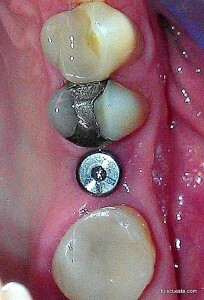 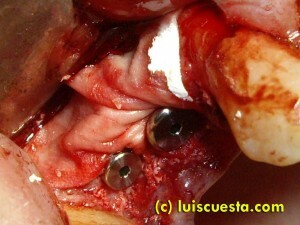 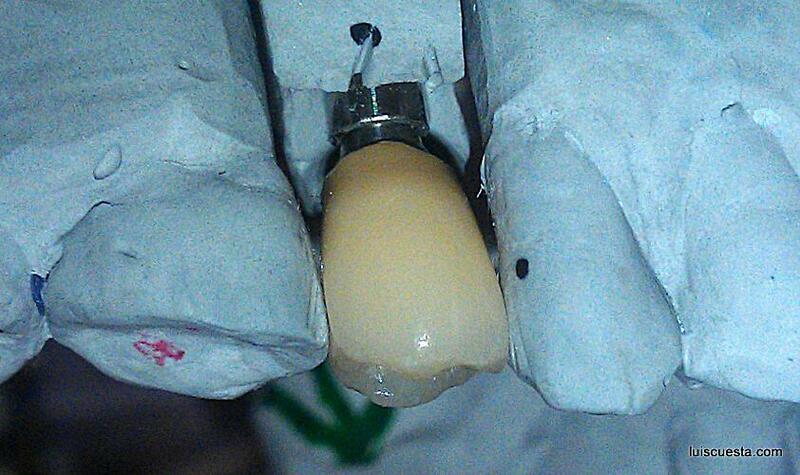 So, my decision is to place two implants, with two small crowns in the end. 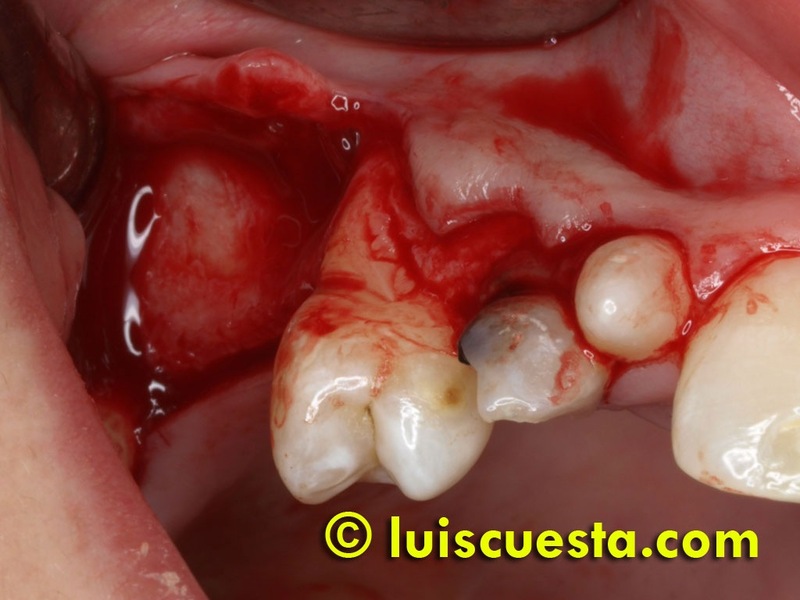 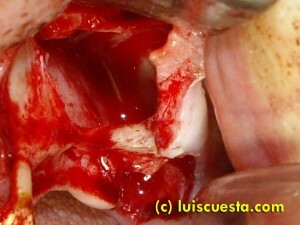 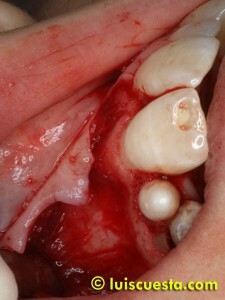 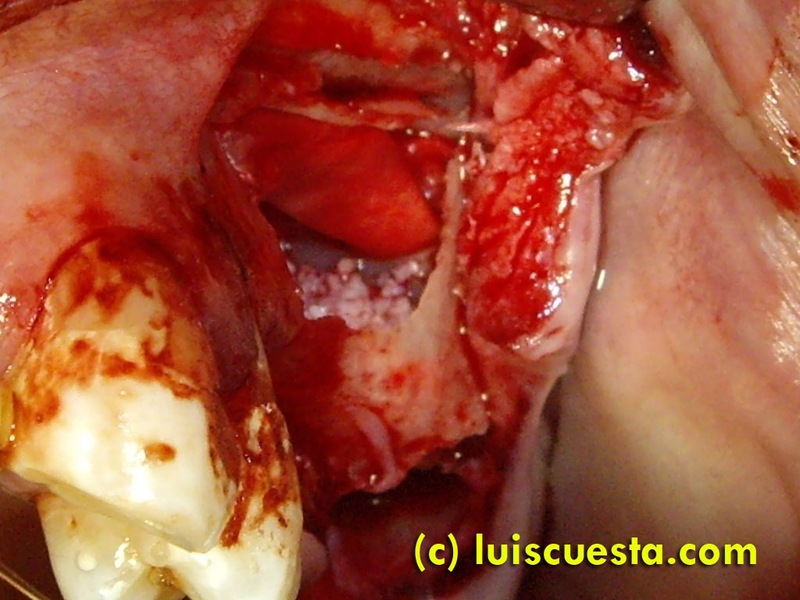 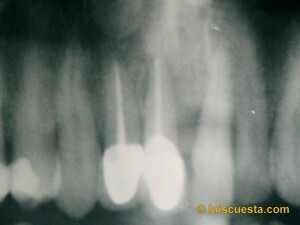 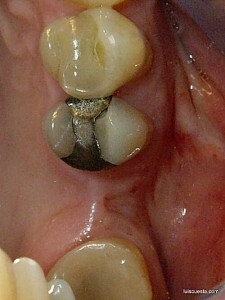 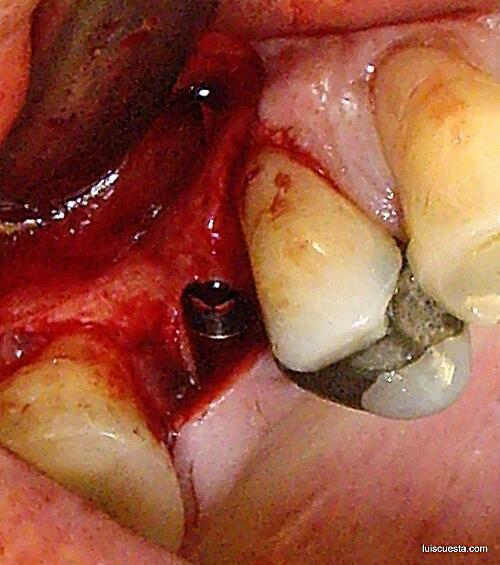 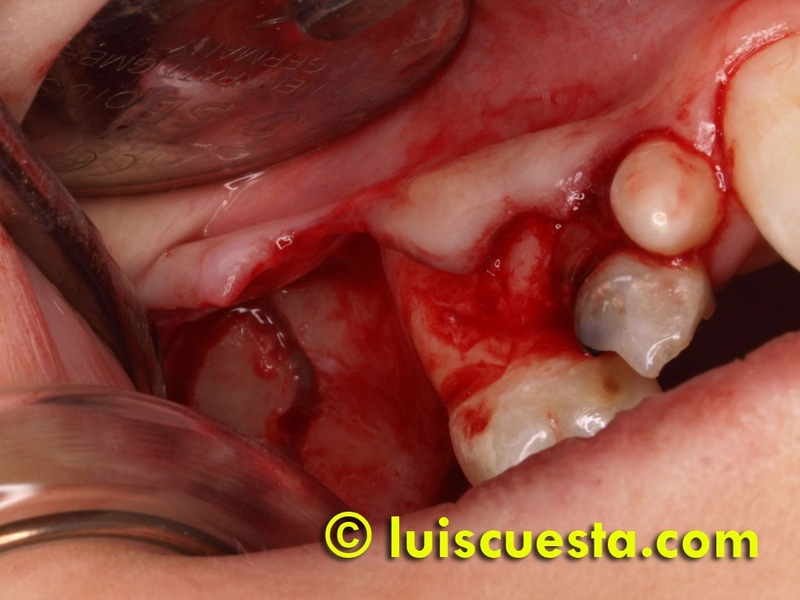 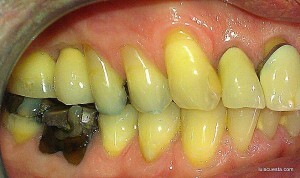 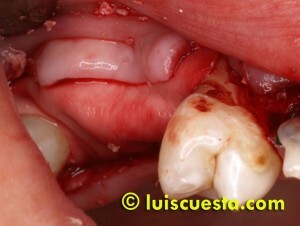 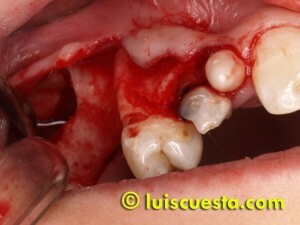 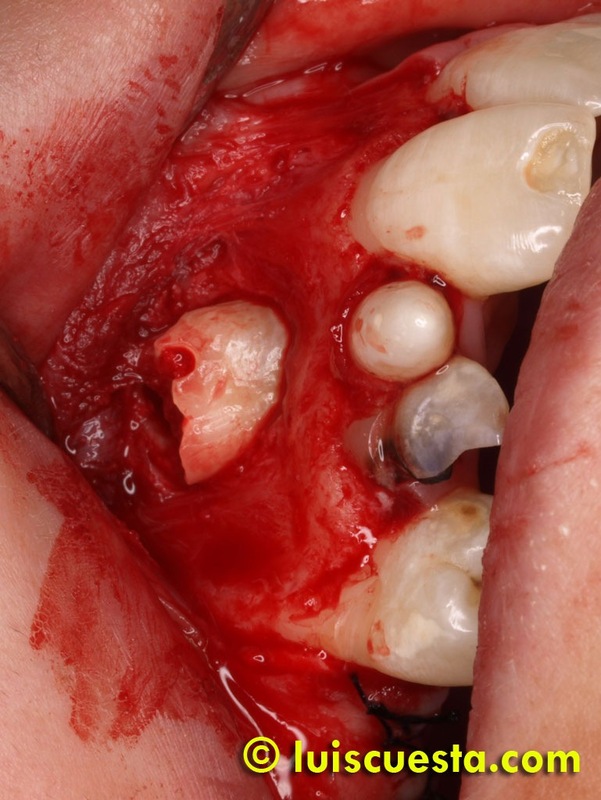 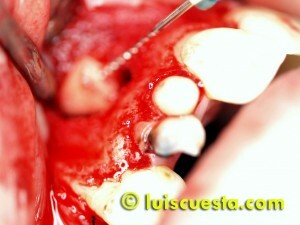 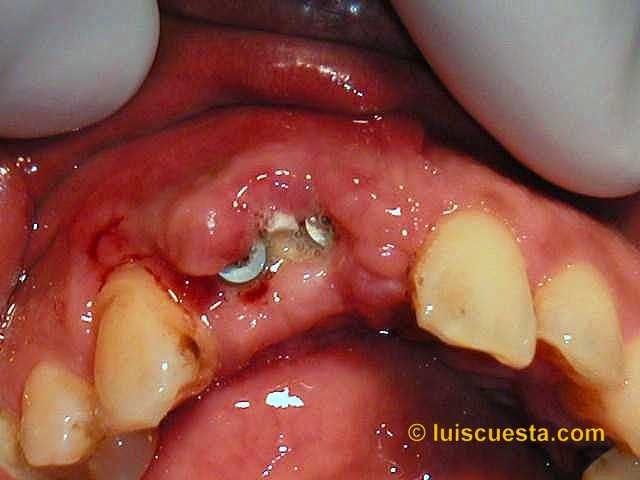 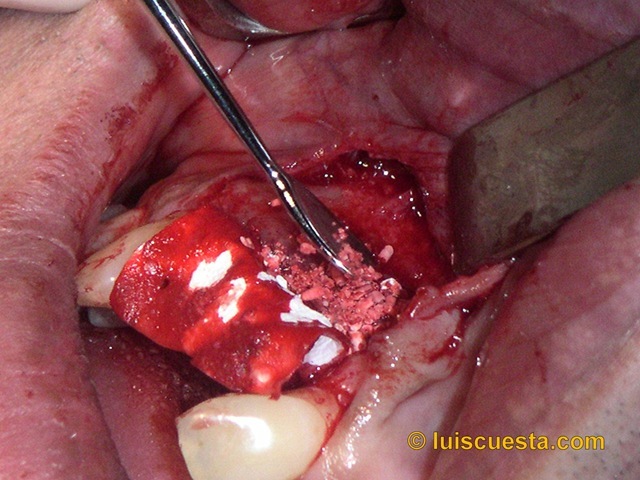 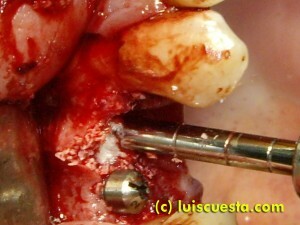 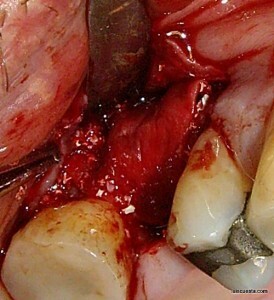 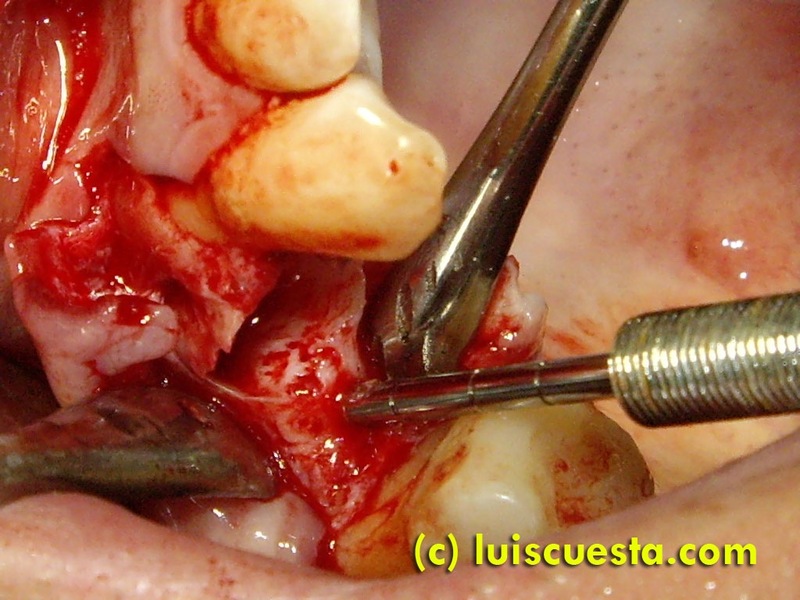 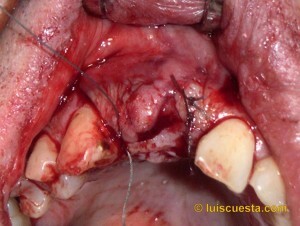 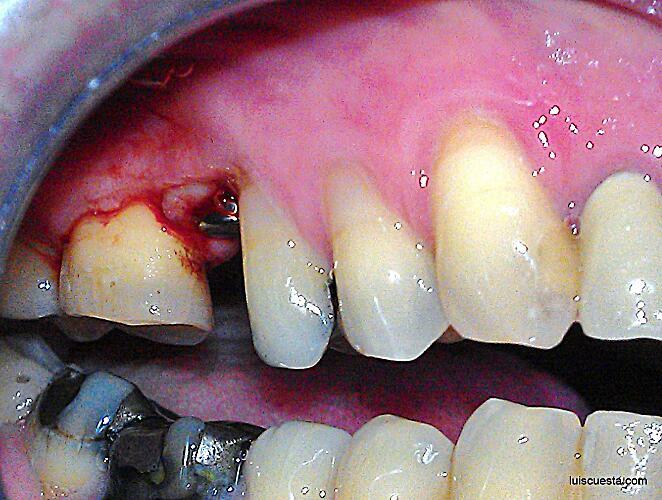 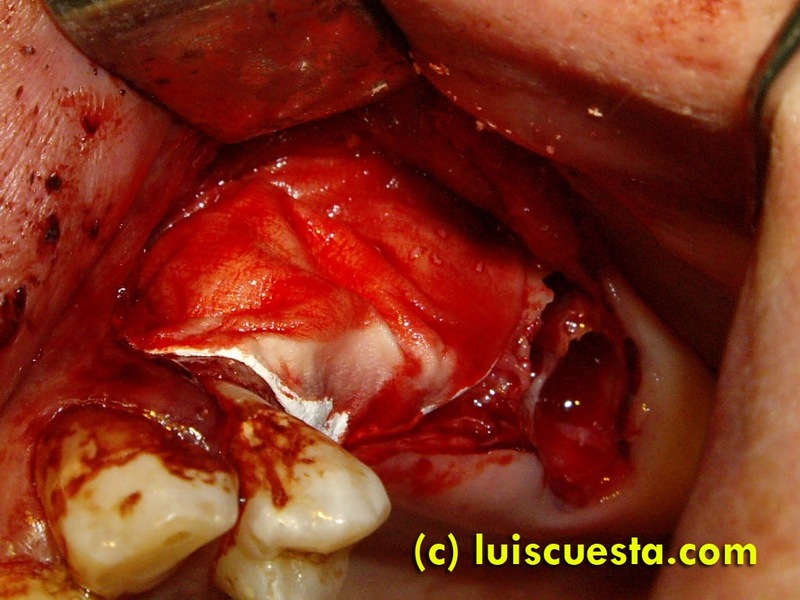 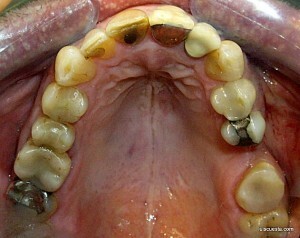 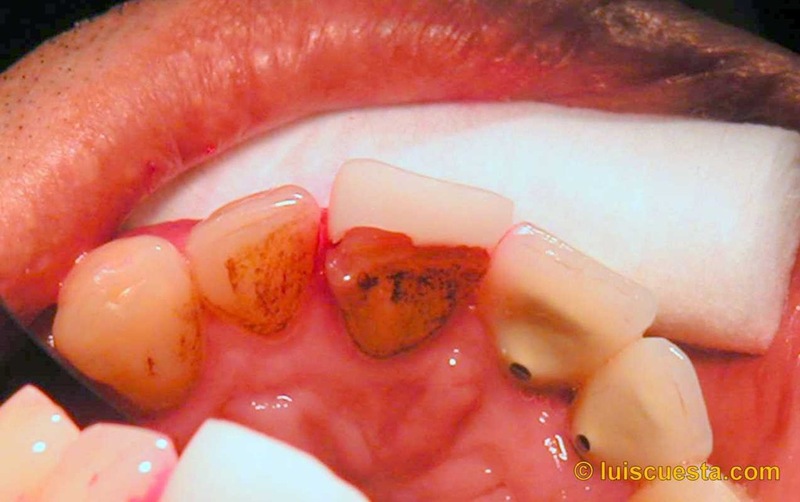 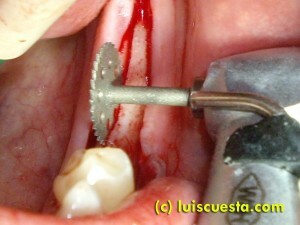 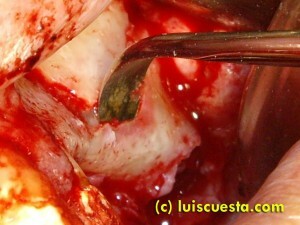 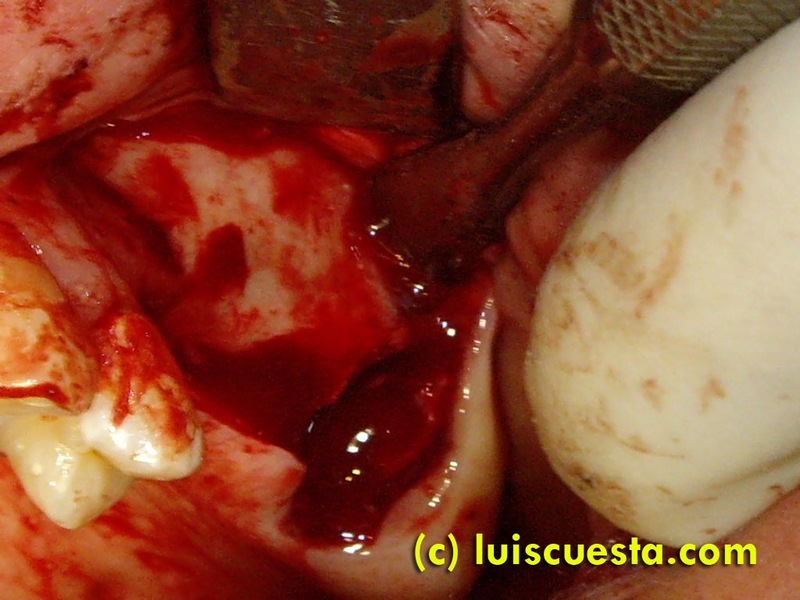 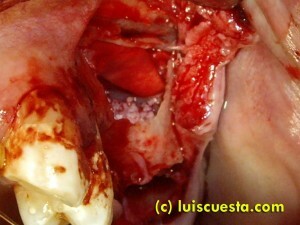 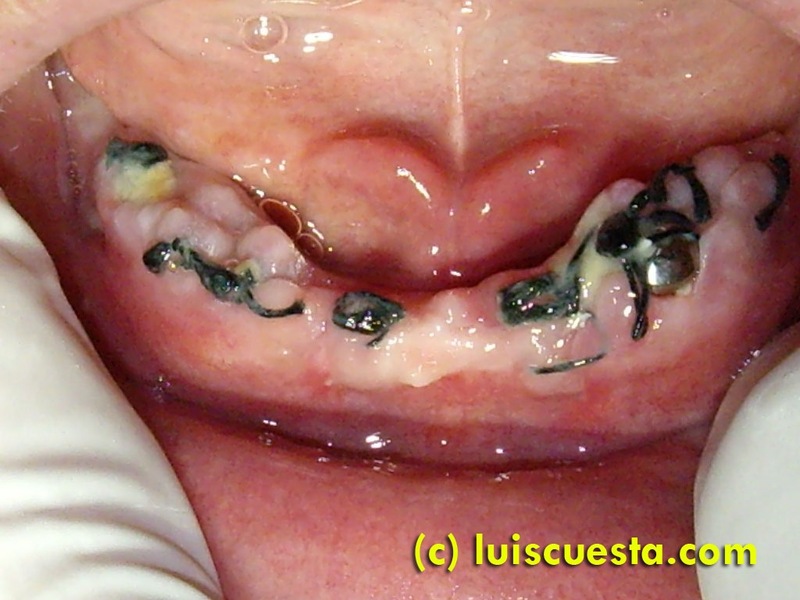 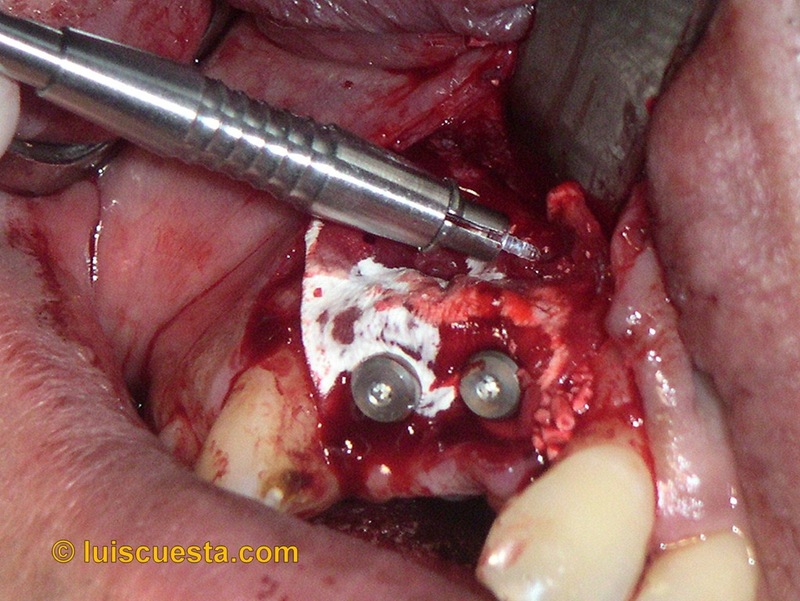 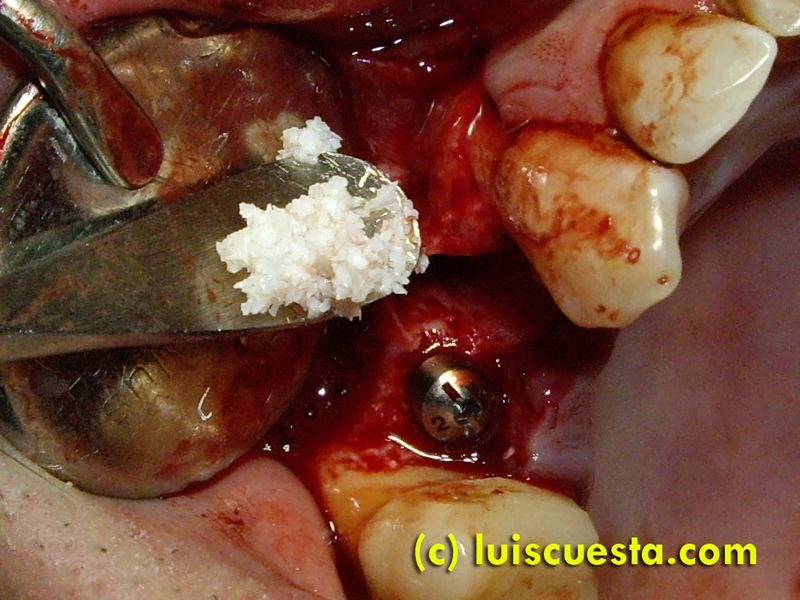 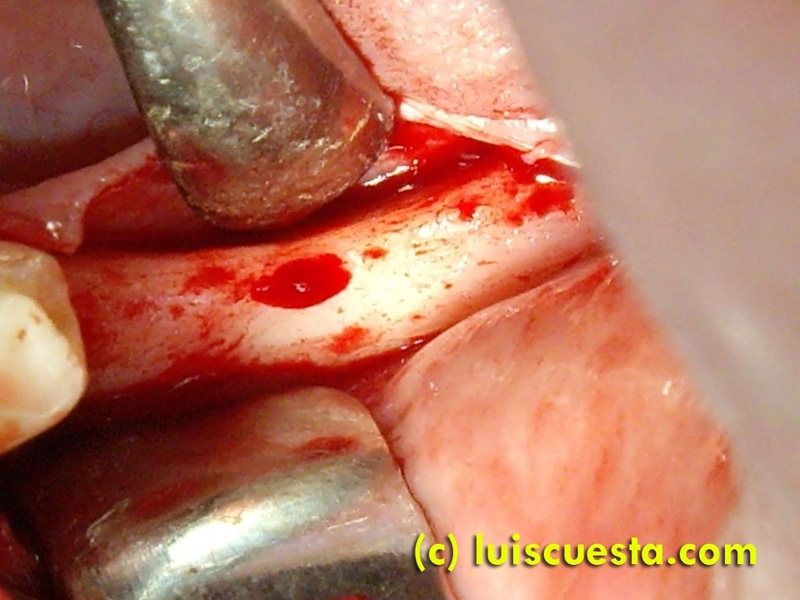 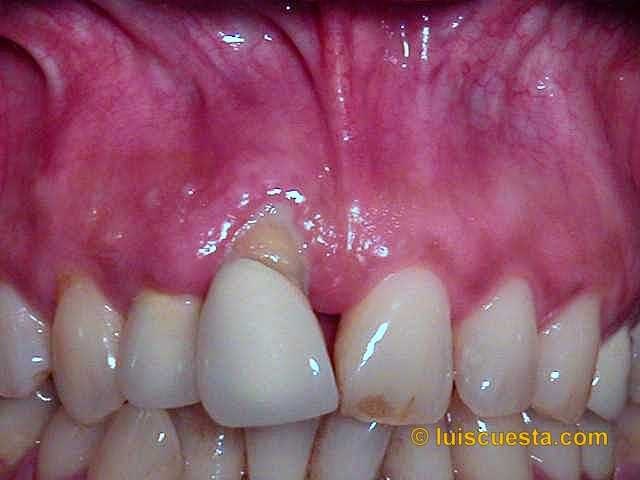 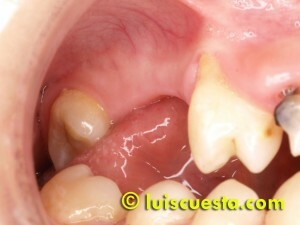 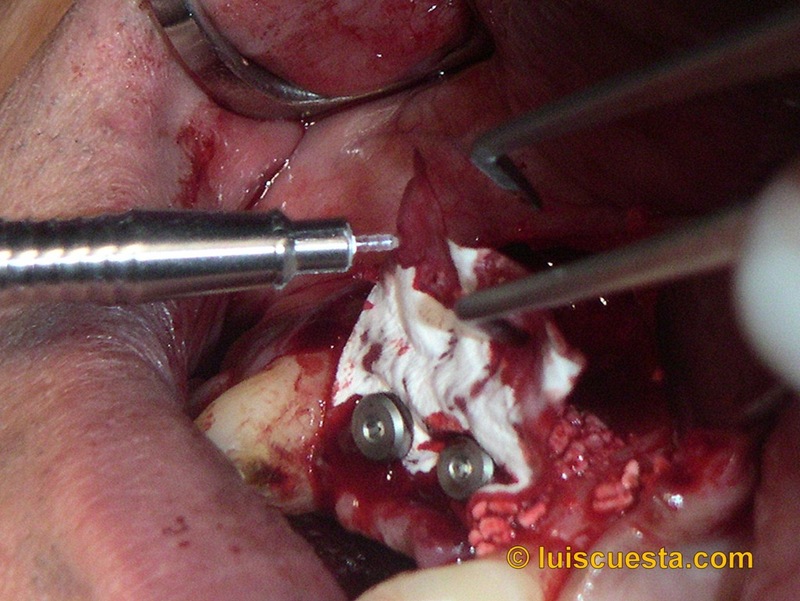 I first extract a decayed root with a periapical granuloma. 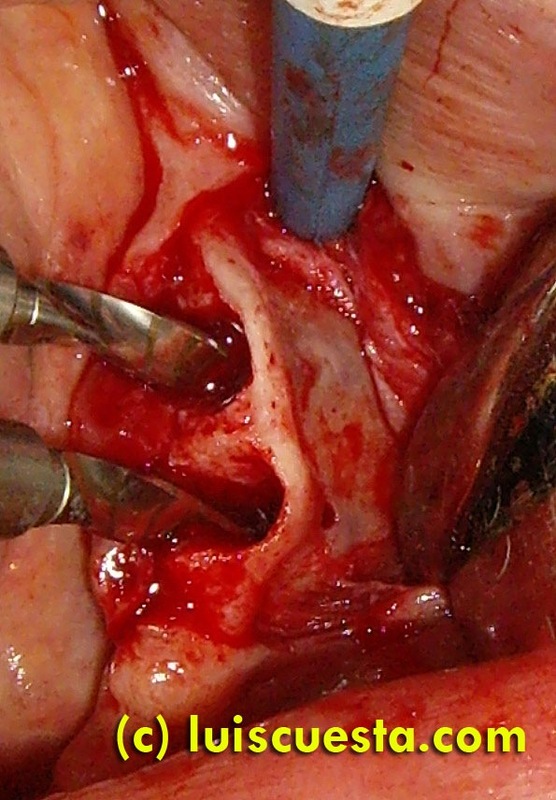 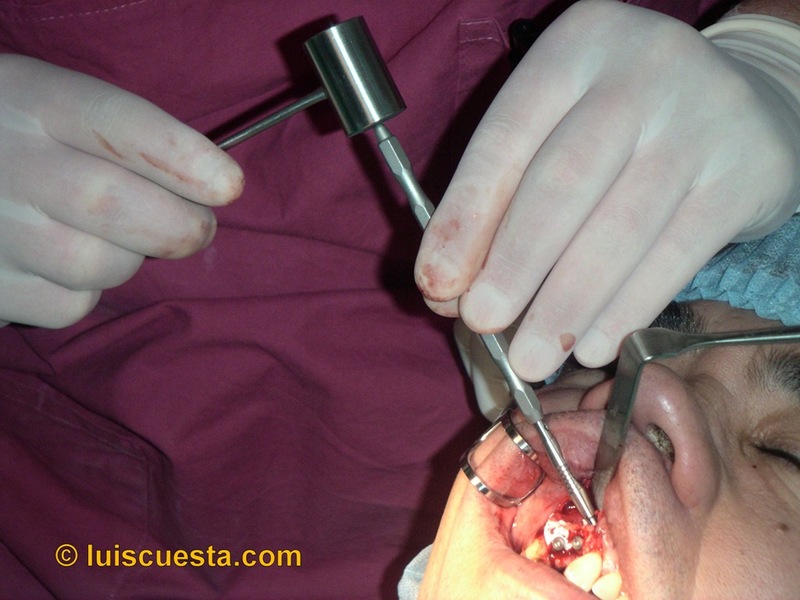 I open up the flap and start the vertical sinus lift with osteotoms, on both 15 and 14 places, starting by the narrowest one. Note the damaged, thin cortical layer at 14. 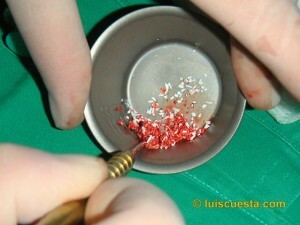 Through the perforation, I apply small pieces of collagen sponges mixed with bone graft. 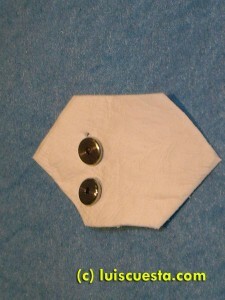 Then, I place a 3.25×11.5 on 15, and a 3.75×13 on piece 14. 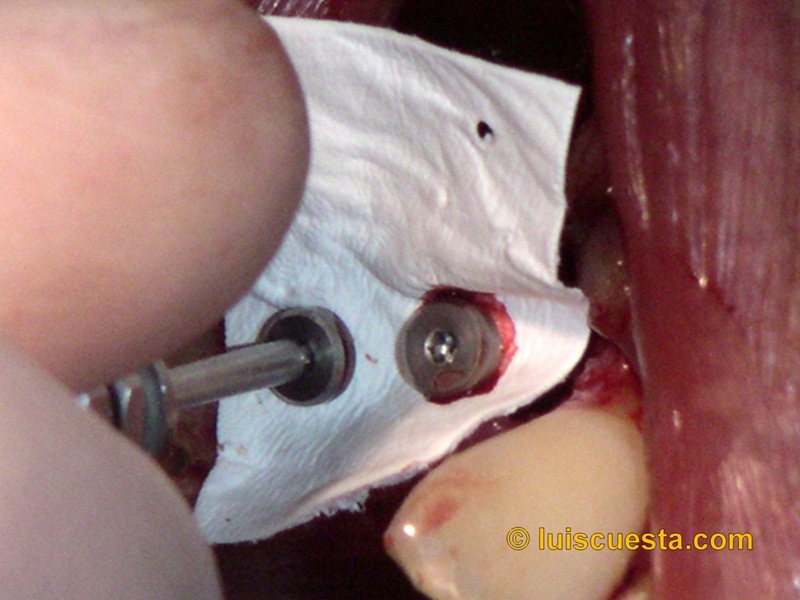 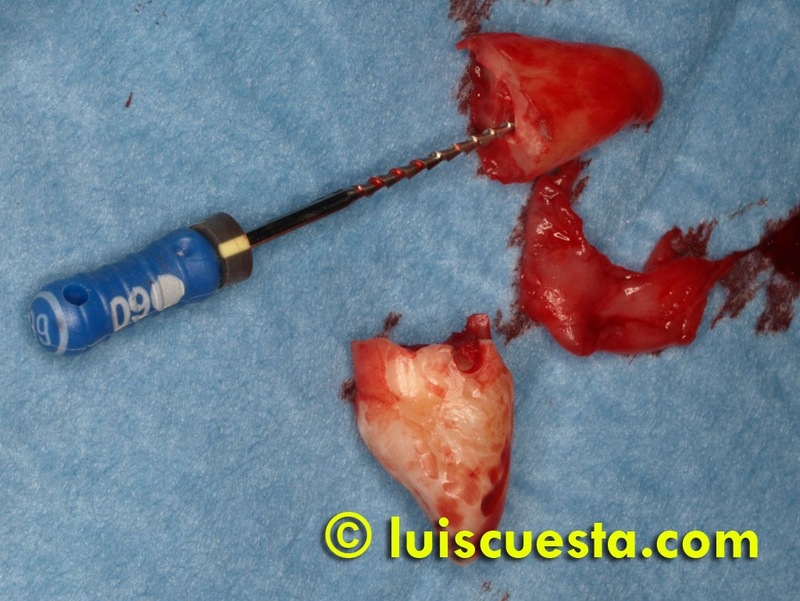 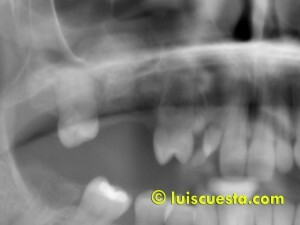 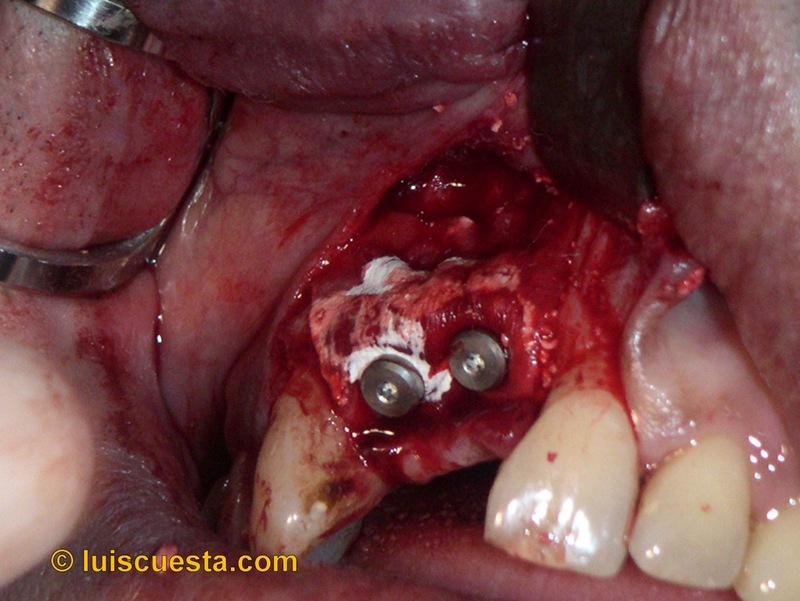 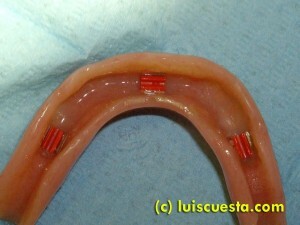 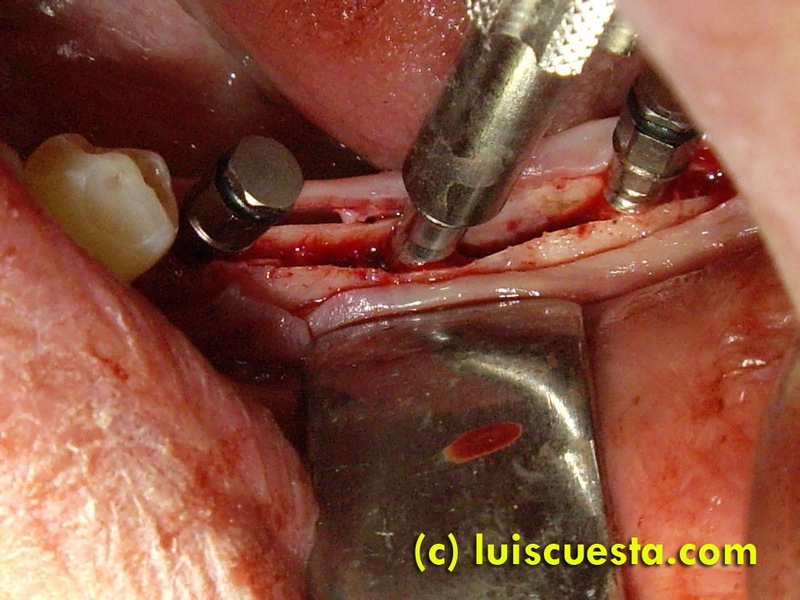 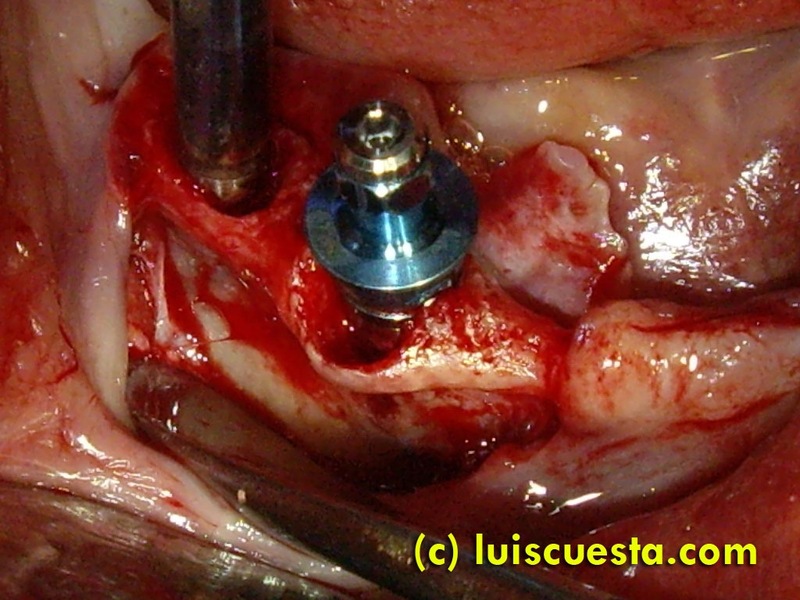 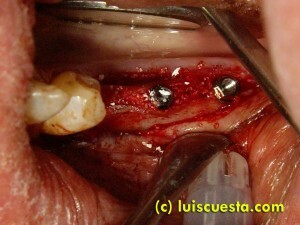 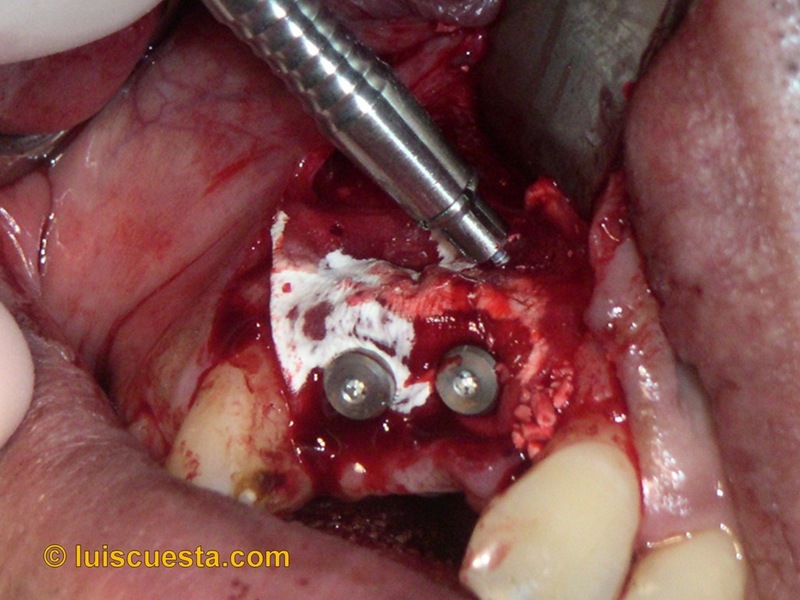 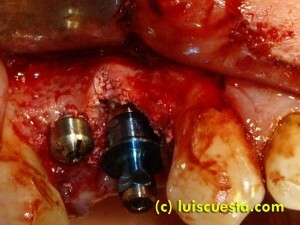 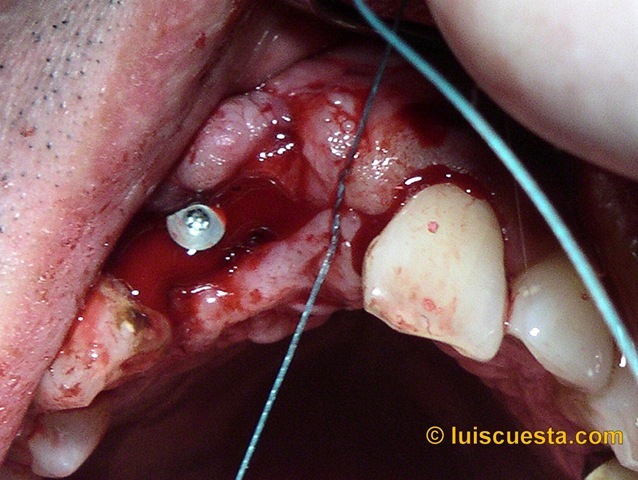 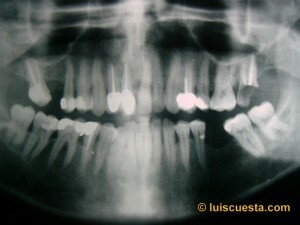 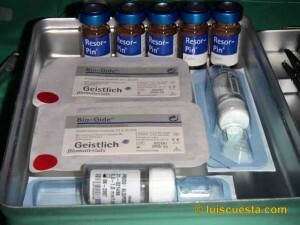 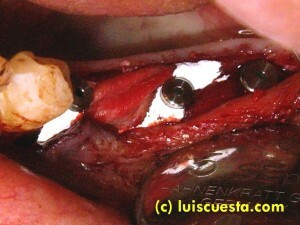 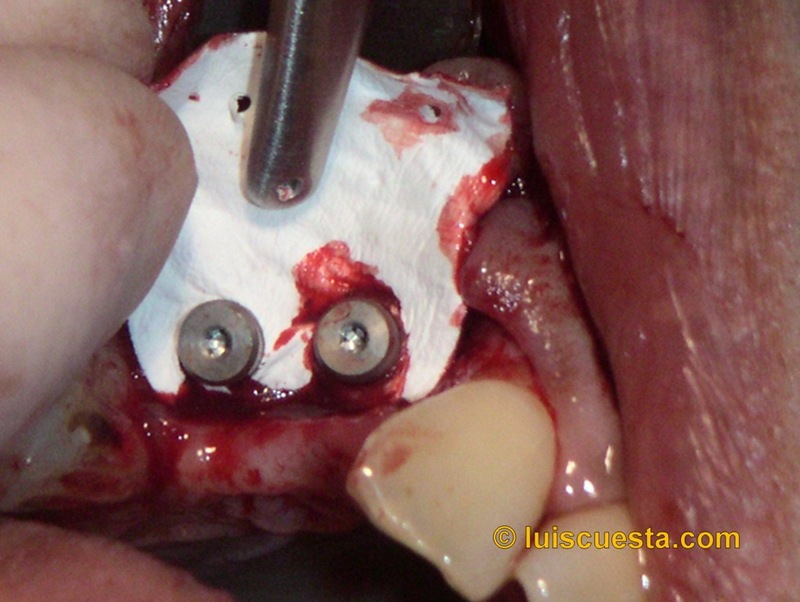 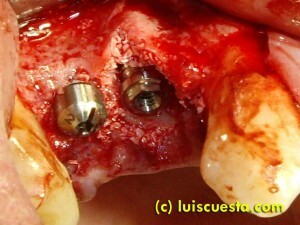 I cover the defect with Bio-Oss bone graft and a Bio-guide resorbable collagen membrane fixed by the healing screws. 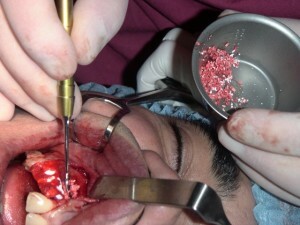 The upper left jaw needs a wide sinus lift in order to lace implants at a later stage. 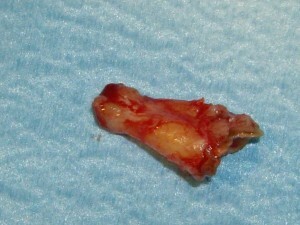 There is a no residual bone left at all. I extract the damaged root and open a wide flap. 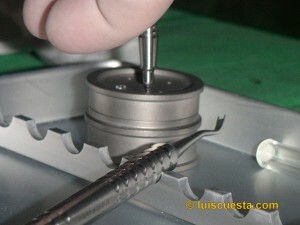 I drill quite a wide lateral “window” carefully, not to perforate the membrane. At first touch one can appreciate the extreme thinness of the bone here. 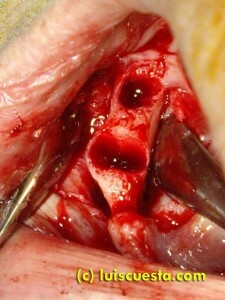 While separating the membrane a perforation occurs. 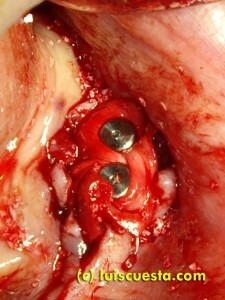 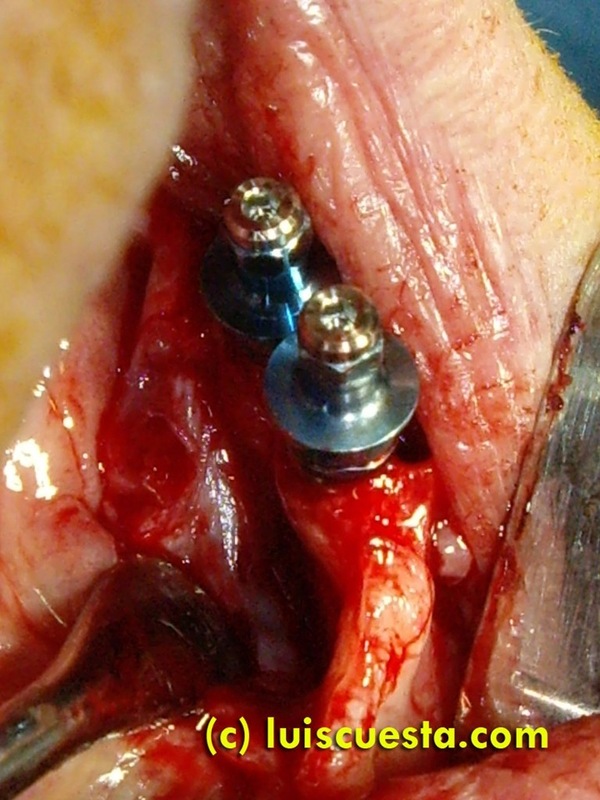 I keep separating, since we’ll need a big volume graft to allow the future implants to hold on to. 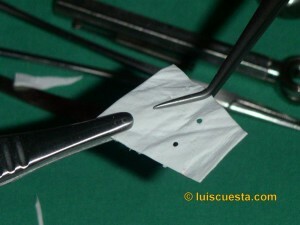 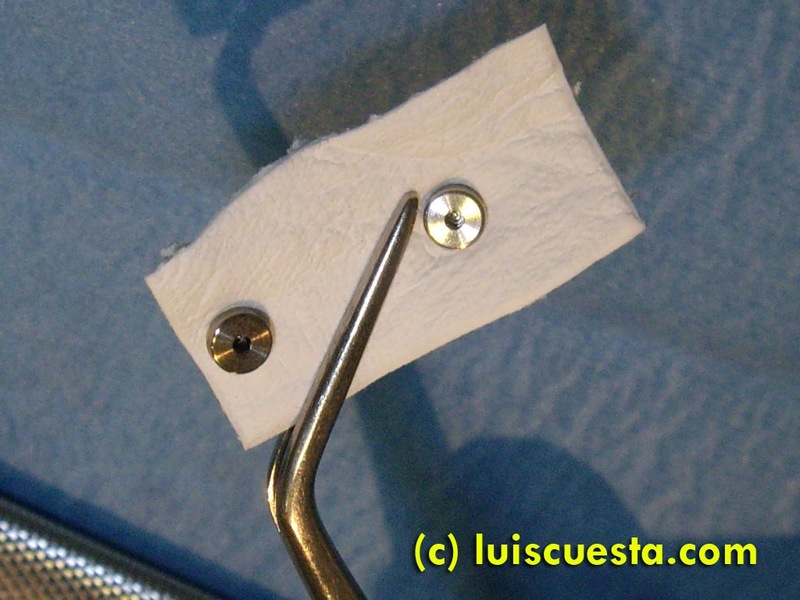 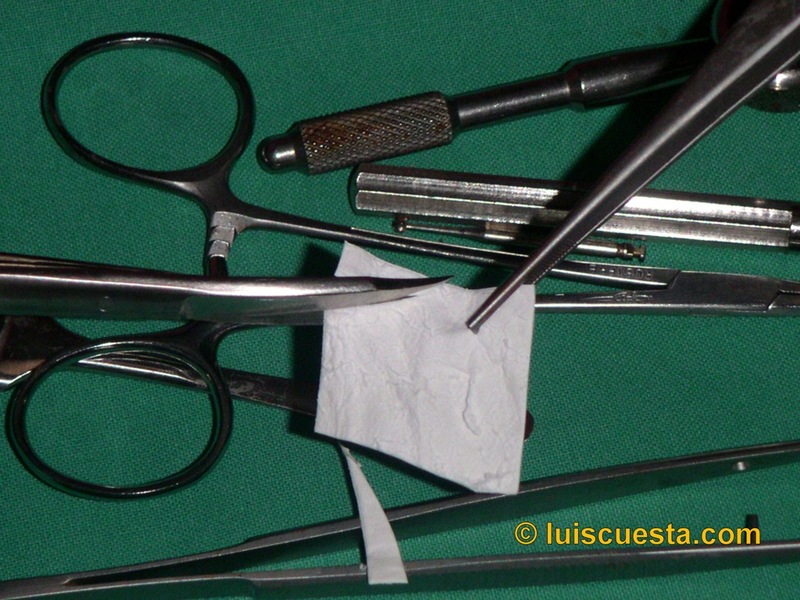 and cover the graft laterally with another Bio-Guide membrane, closing the flap on top. 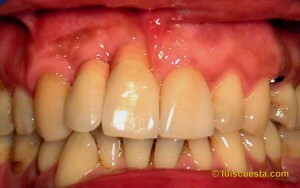 Again, the before and after panorex. 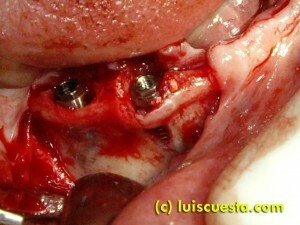 Now we need to wait at least six months to place the implants on the left sinus graft.